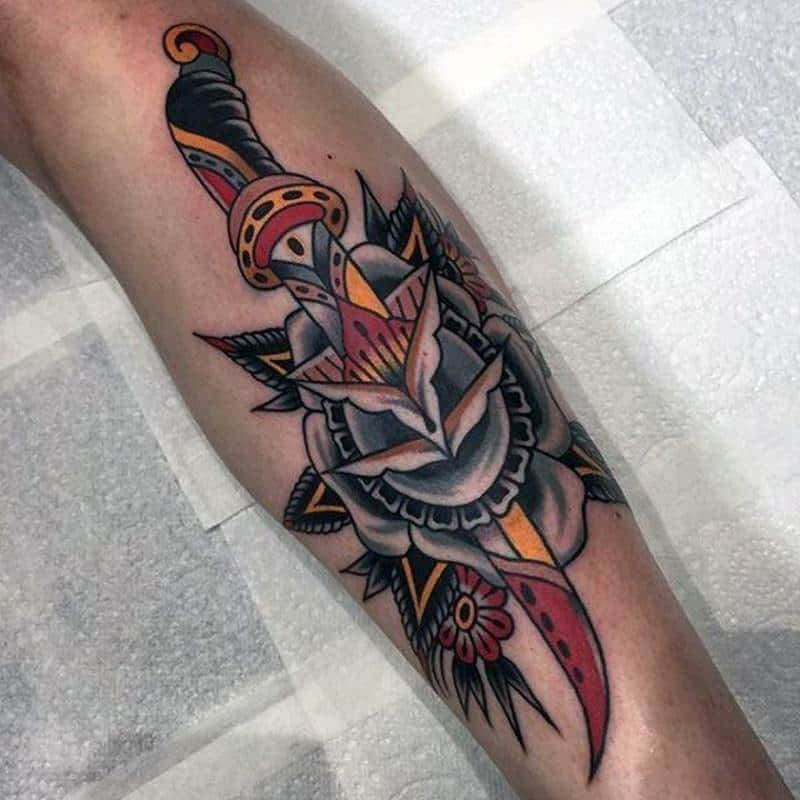 If you are looking for a new tattoo idea this year, something that is sharp and mysterious, then why not try out a knife or dagger tattoo? 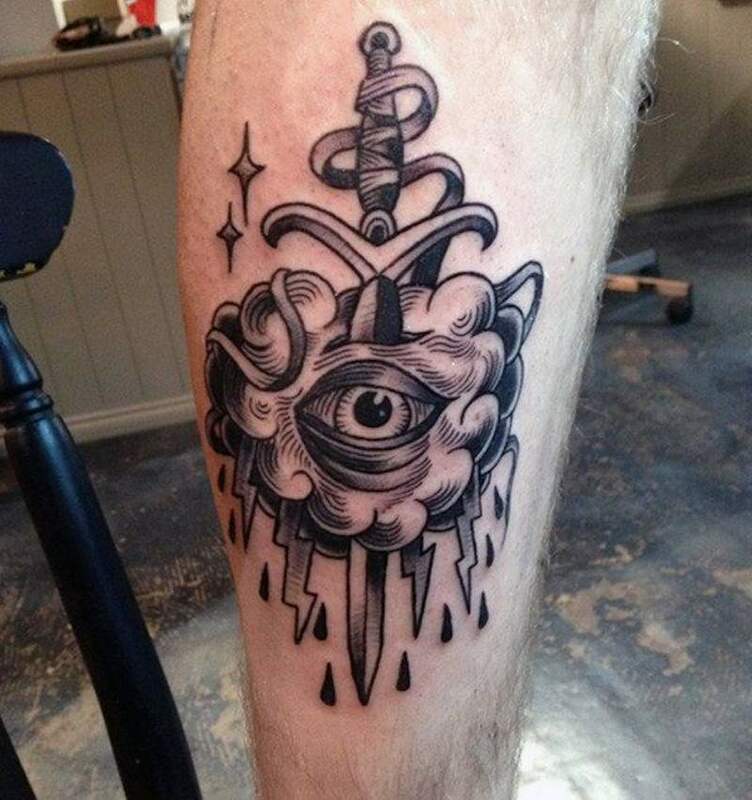 These styles are always one of a kind and they are also pretty badass. 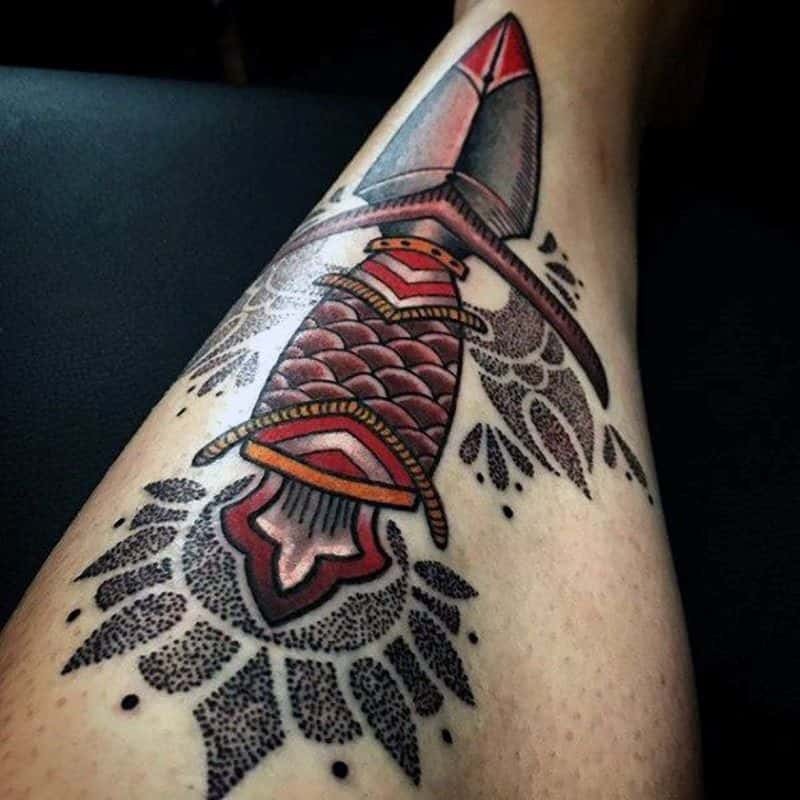 It’s not a mainstream tattoo and certainly not popular enough to see all over the place. 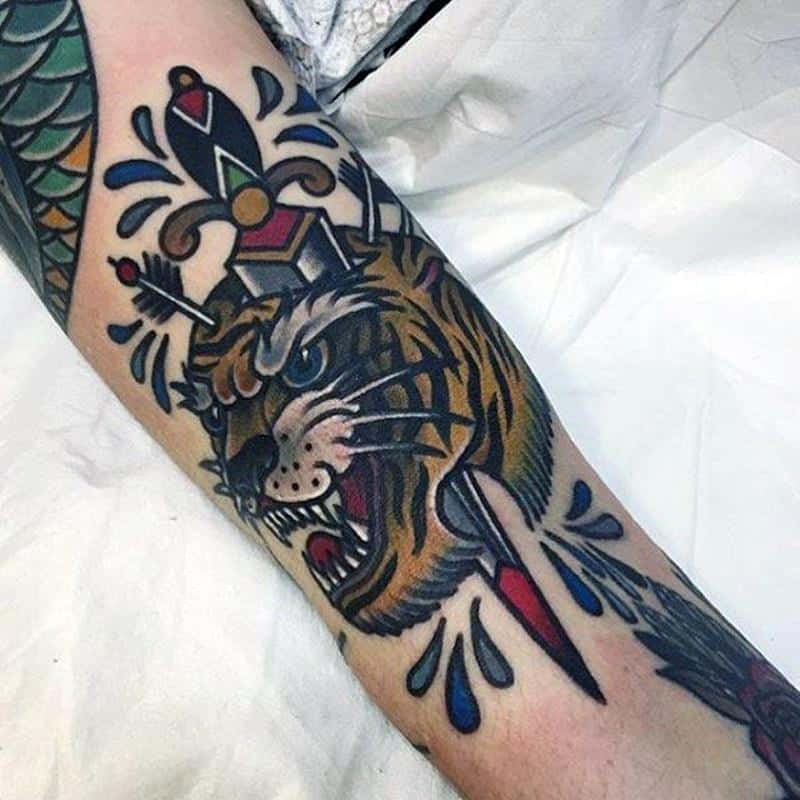 Many people are drawn to the design choice because you can get some pretty unique design choice that is truly original. These styles come in many shapes and styles and there are a ton to choose from so you will have plenty of inspiration. 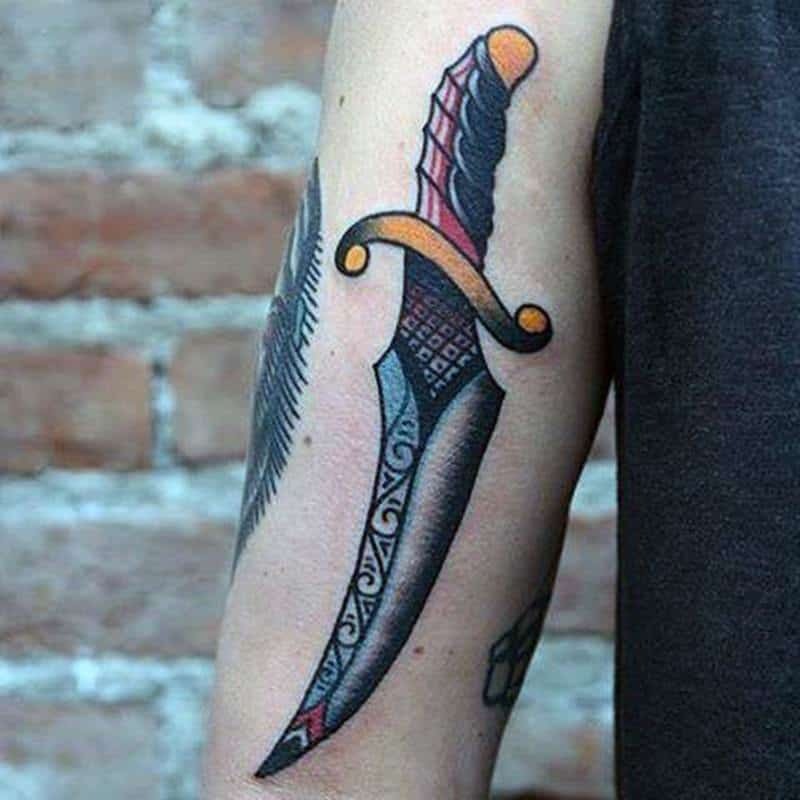 There are a ton of different meanings of the dagger tattoo and we will go into that later. 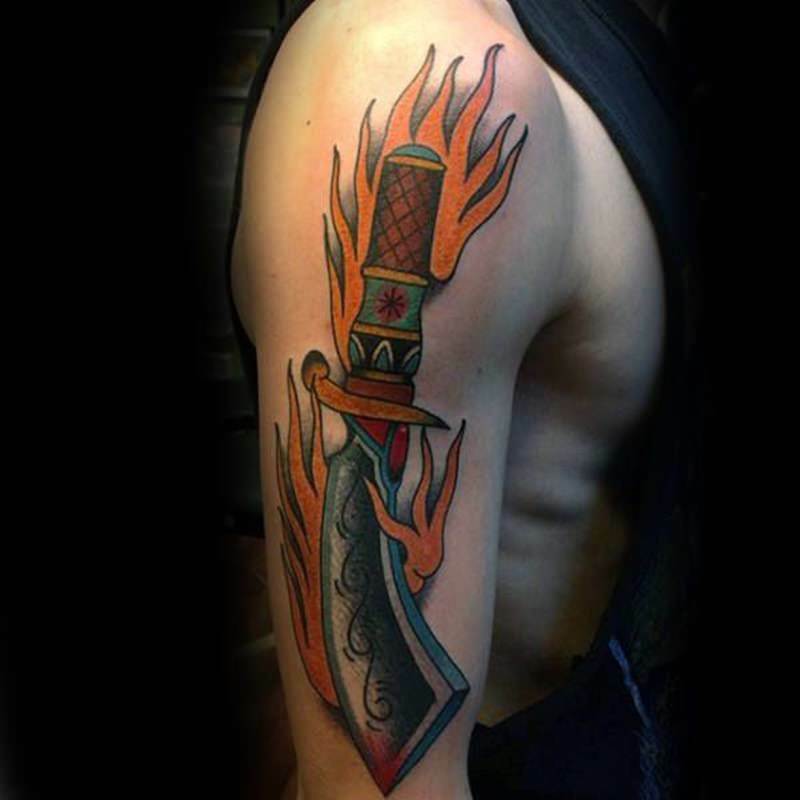 You can also add many different elements to the dagger or knife tattoo that can personalize it for yourself. 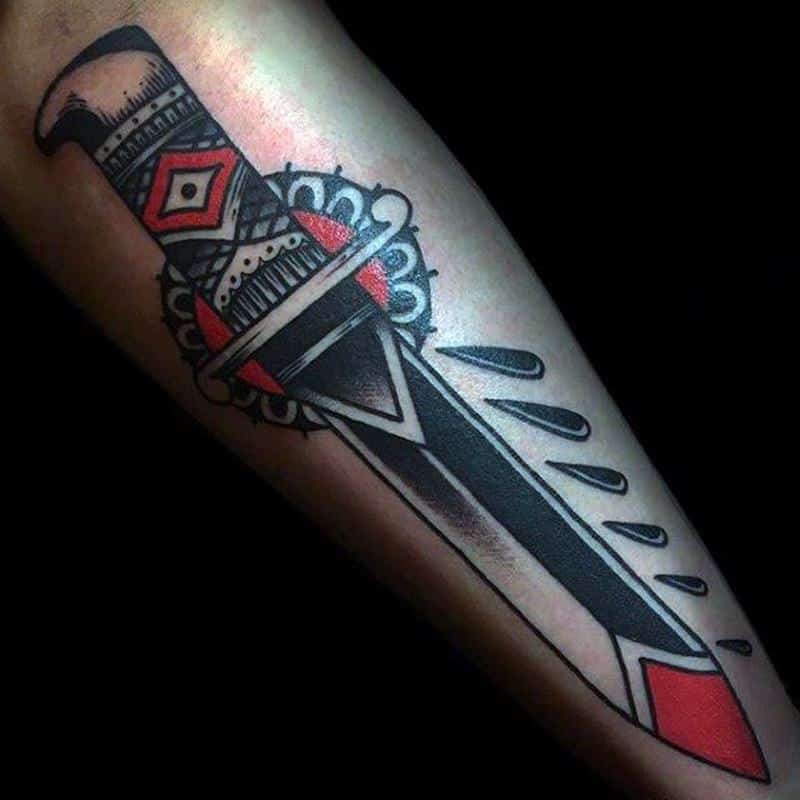 This is more of a traditional design when it comes to the dagger tattoo. It has a cartoonish look to it with bright colors. Maybe it’s a broken heart that you are suffering from, we can all understand that. 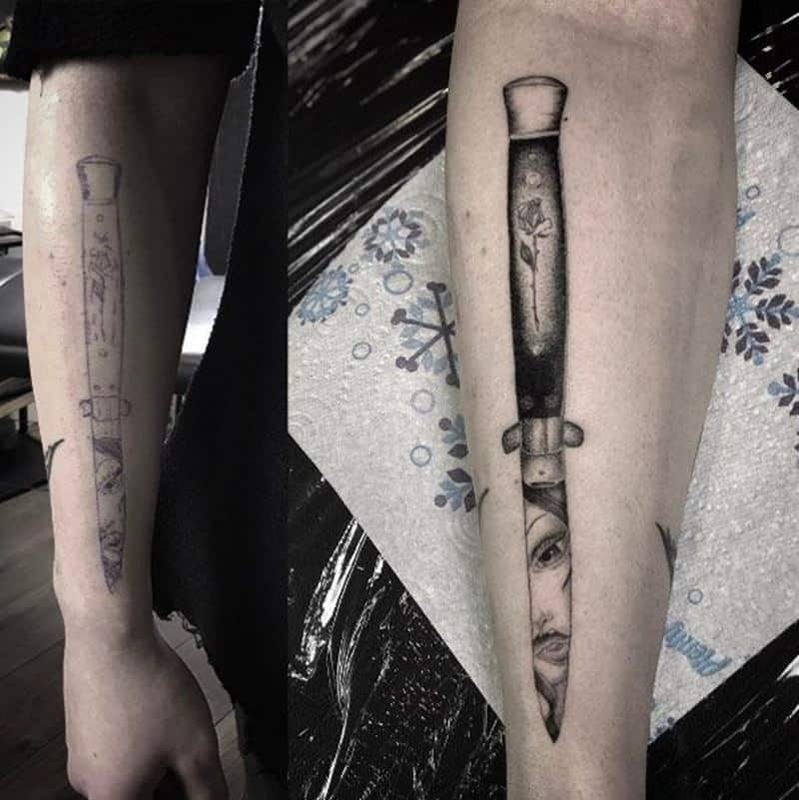 This might be exactly the tattoo that you are looking for. 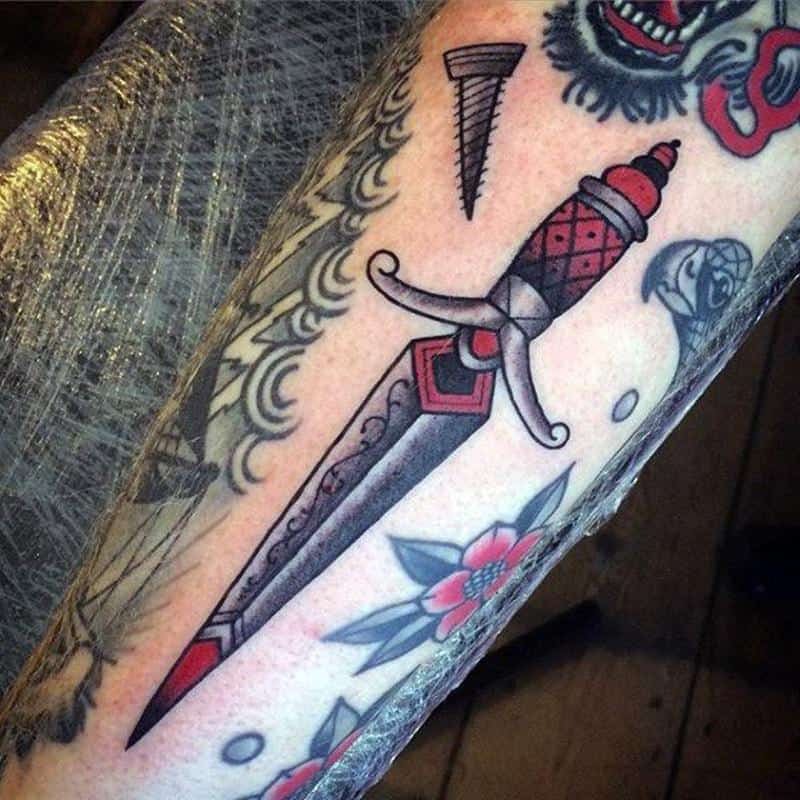 If you are going to go for a dagger design, why not do something with a little personality to it. 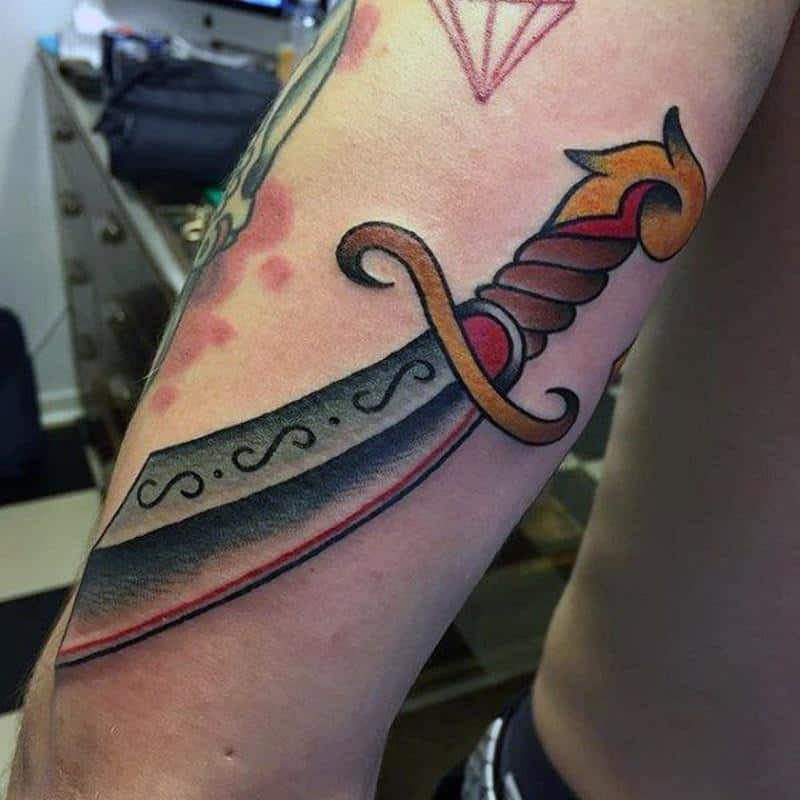 This is more of a knife than a dagger but it has fire lapping around the edges. If you are looking for something cool, then you can’t go wrong with this style. 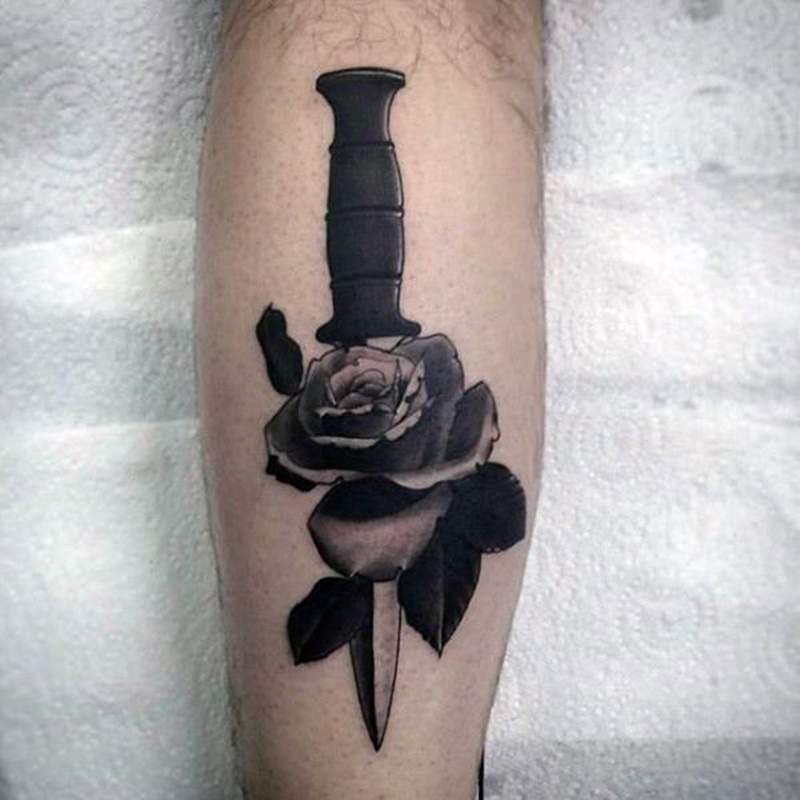 One of the elements that you can add to the knife design is a rose. 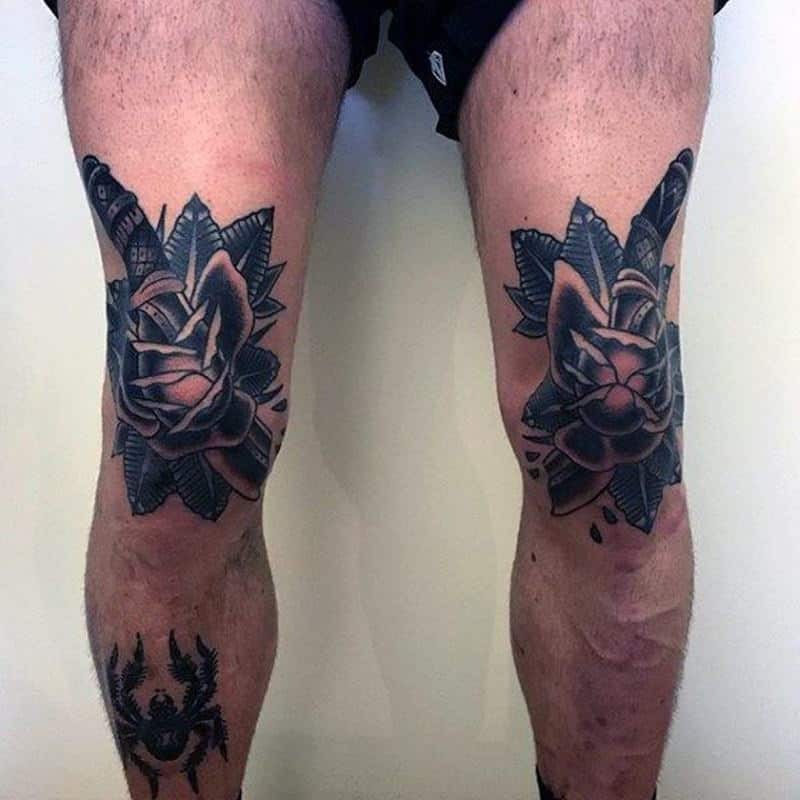 Roses are so popular when it comes to tattoo designs. This is a cool image that you will love. 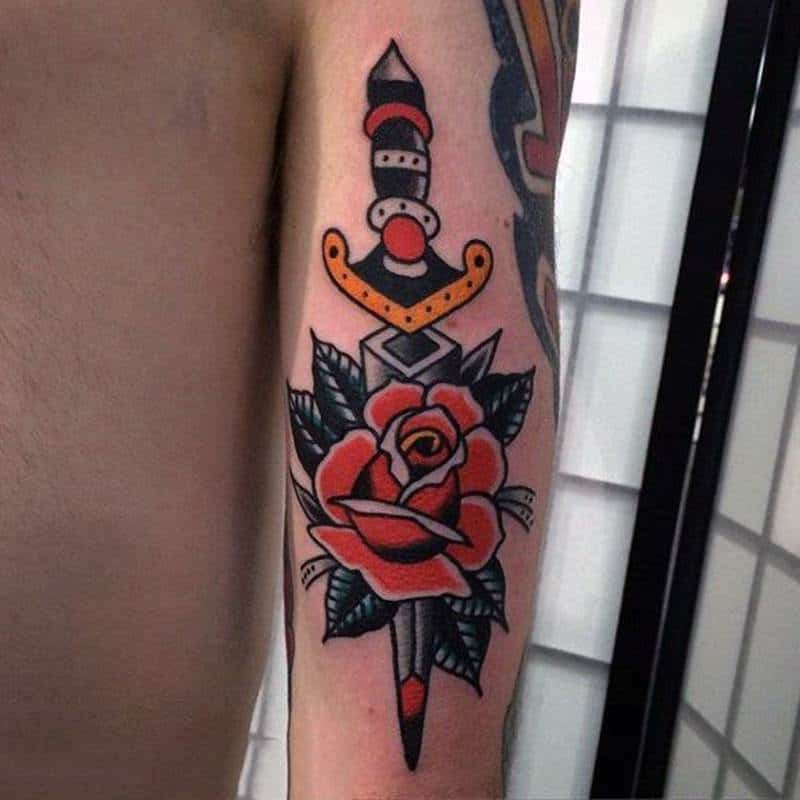 A design like this is sure to put a smile on your face. 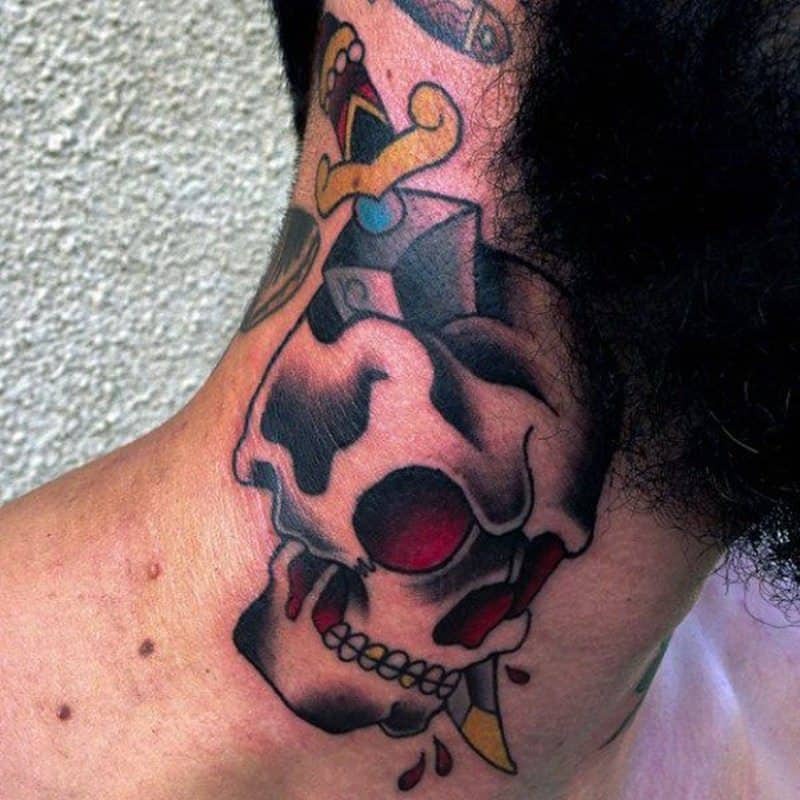 The back if the head is likely to be a painful area for a tattoo as it’s all bone. If you are looking for something that will draw the eye, then this is the style for you. 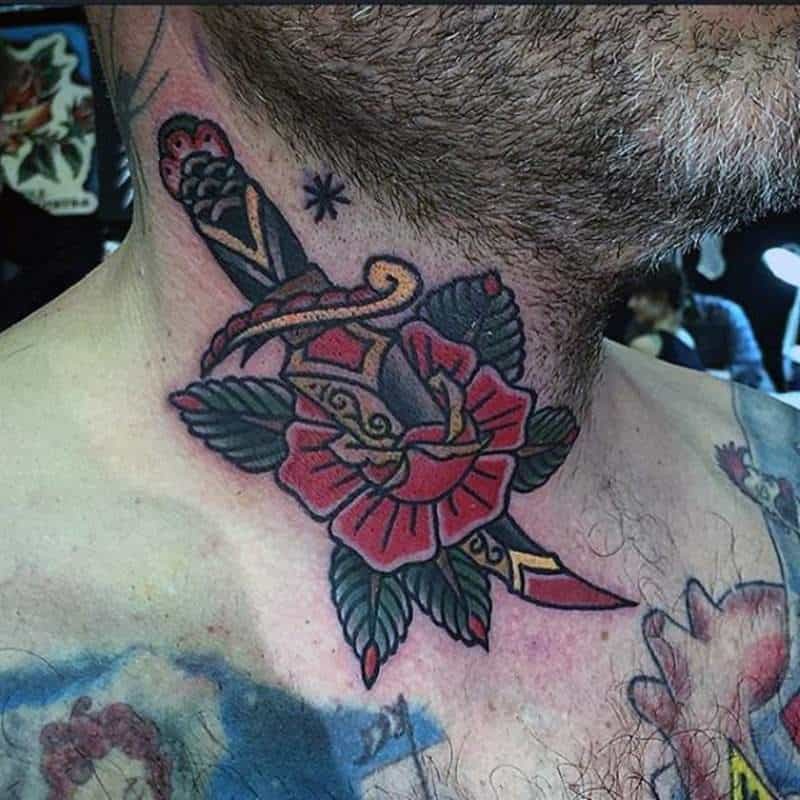 We have another dagger design with a rose but this one is placed on the neck. 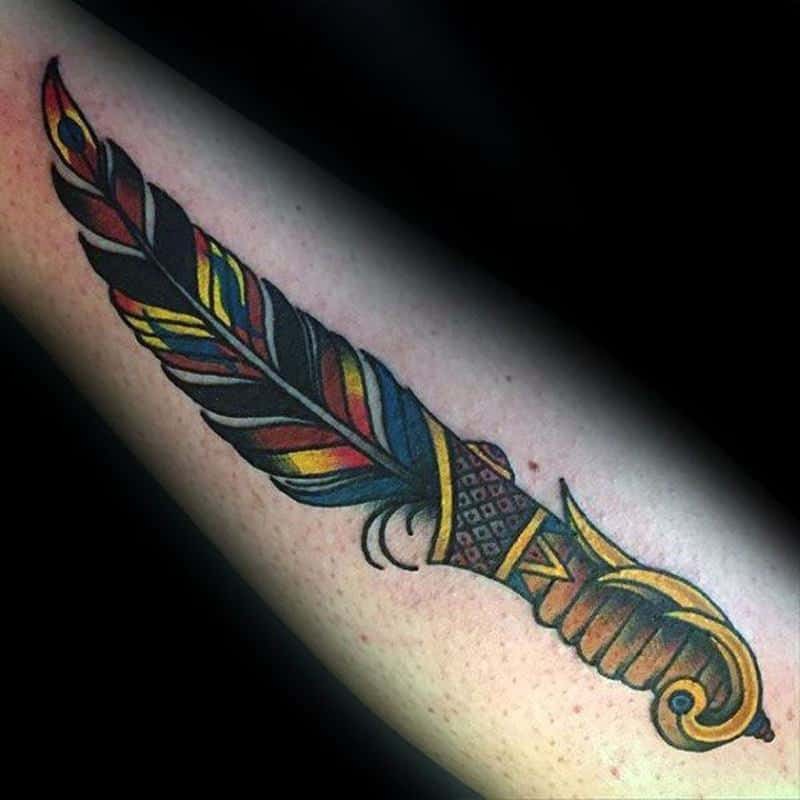 This is a colorful design and we just love how the gold pops right out in this style. 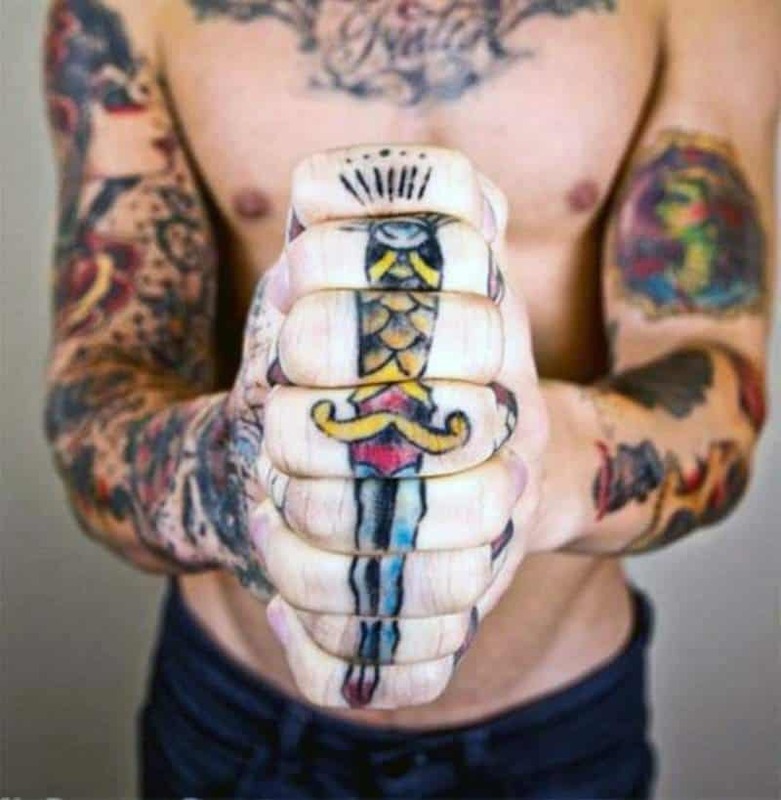 You are not likely to find a more badass style than this one. 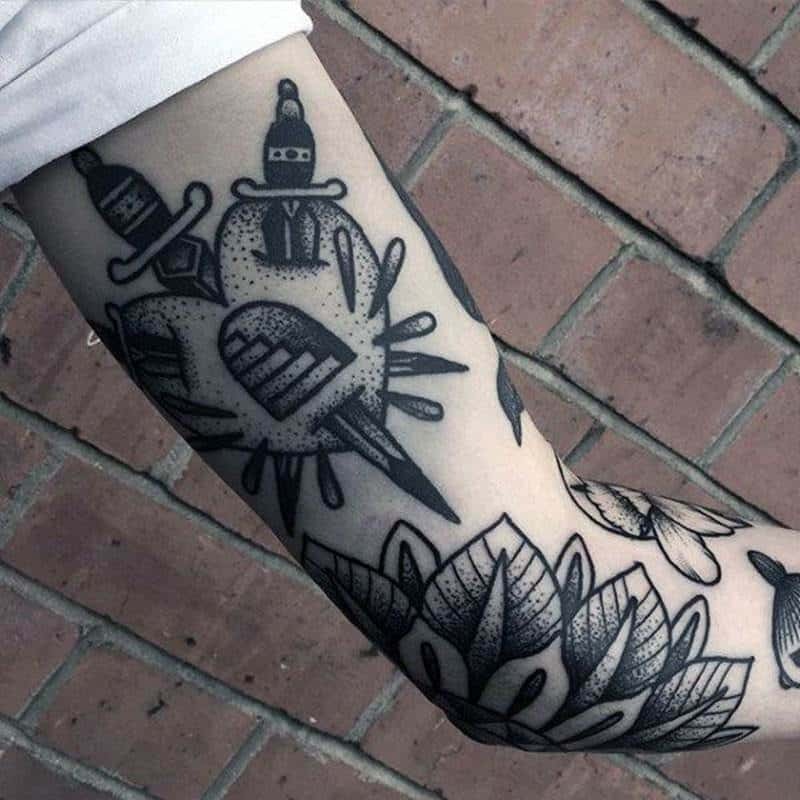 It’s is detailed, creative and bold. If you are looking for something a little more simple, then try this one on for size. 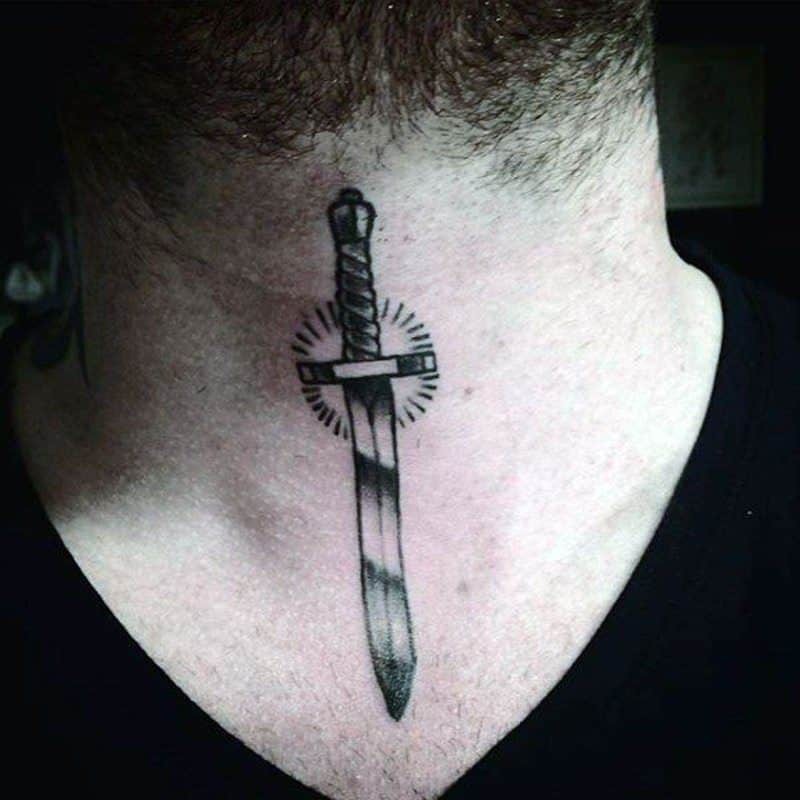 What Does The Dagger Tattoo Mean? 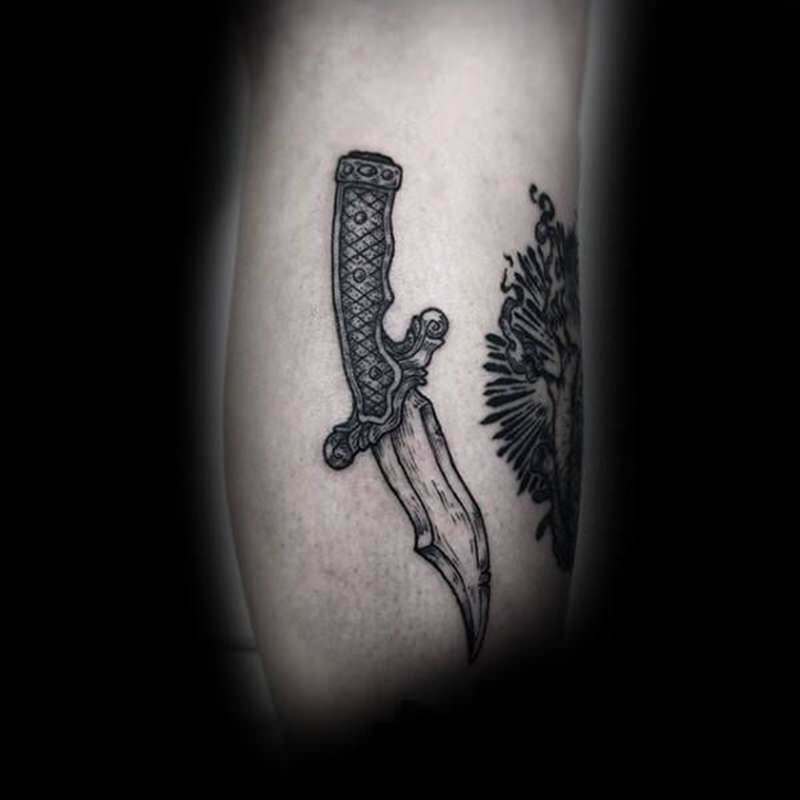 There are many different reasons why someone would choose to get the dagger tattoo. 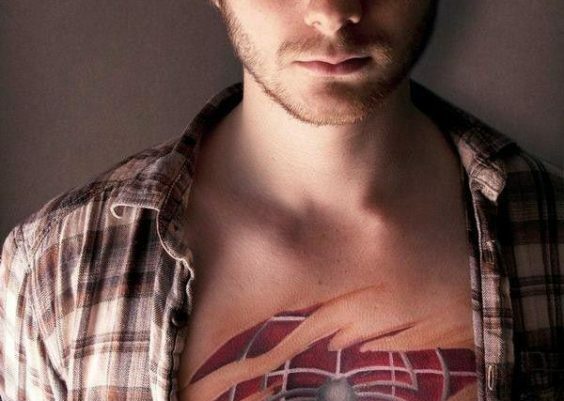 People usually put their own creative twists on the tattoo but overall it means the same thing. 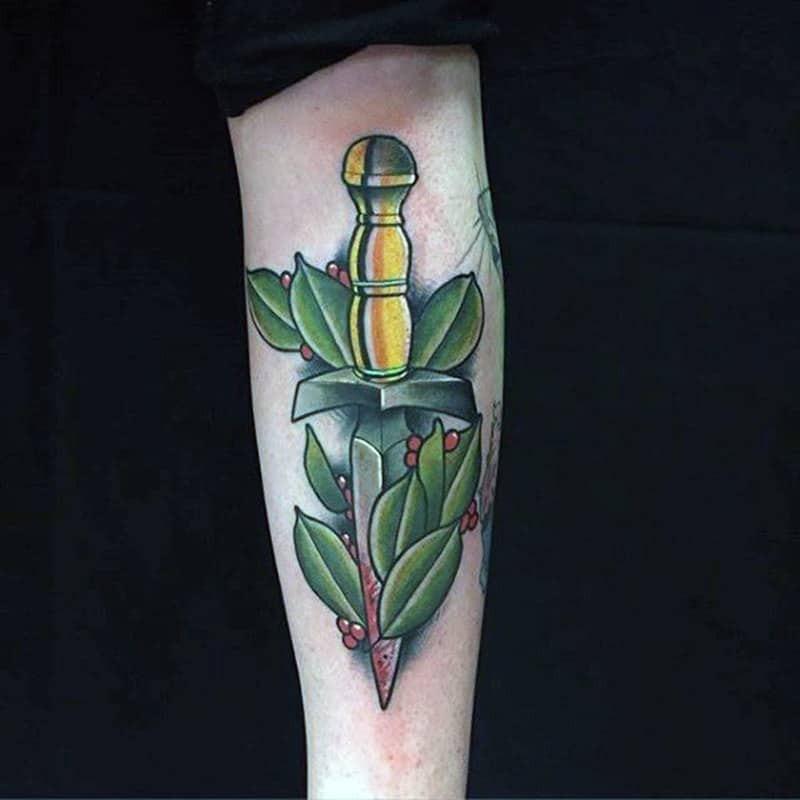 Sometimes daggers can be used in fighting, or used for display purpose or even a symbol of sacrifice. 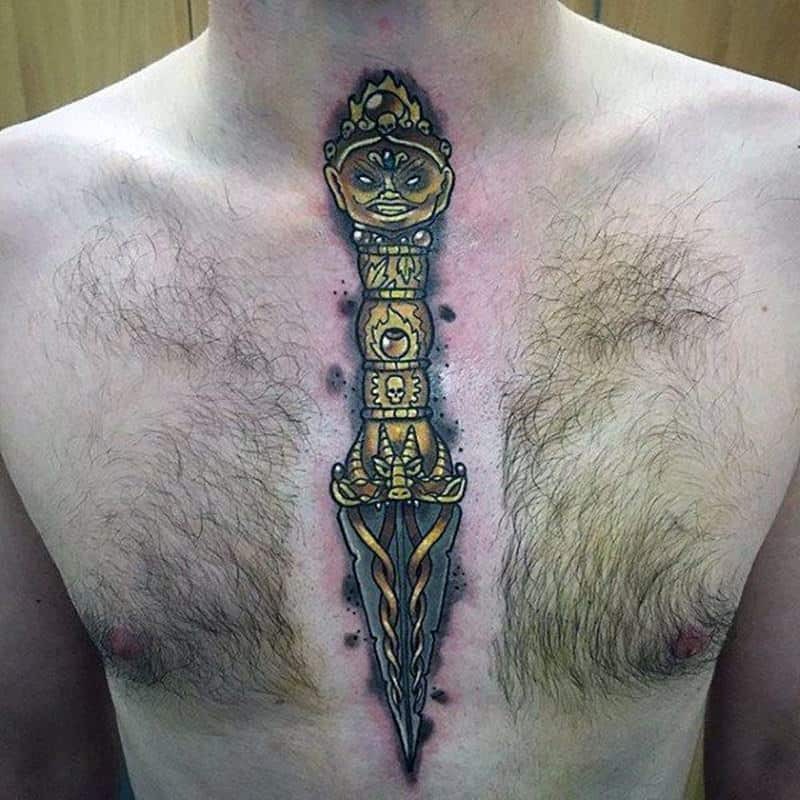 Daggers and knives can also be used as a warning to others to beware of the wearer of the tattoo. 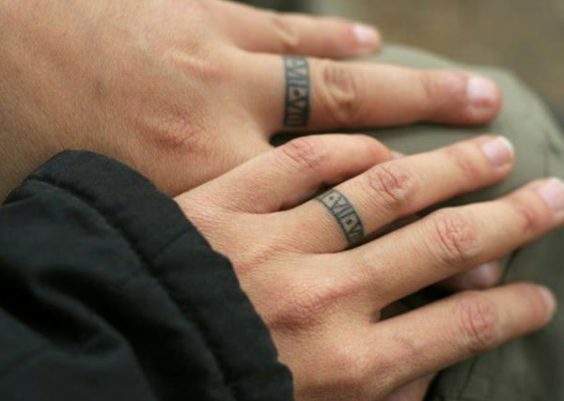 Or a simple meaning could be that it’s a warning to be aware of the inner workings of other people. The great thing, of course, is that you don’t just have to have a danger you can add many things to the style such as dragons, fire, feathers, swallows, snakes, roses, vines and skulls, just to name a few. So, what do some of these symbols mean? 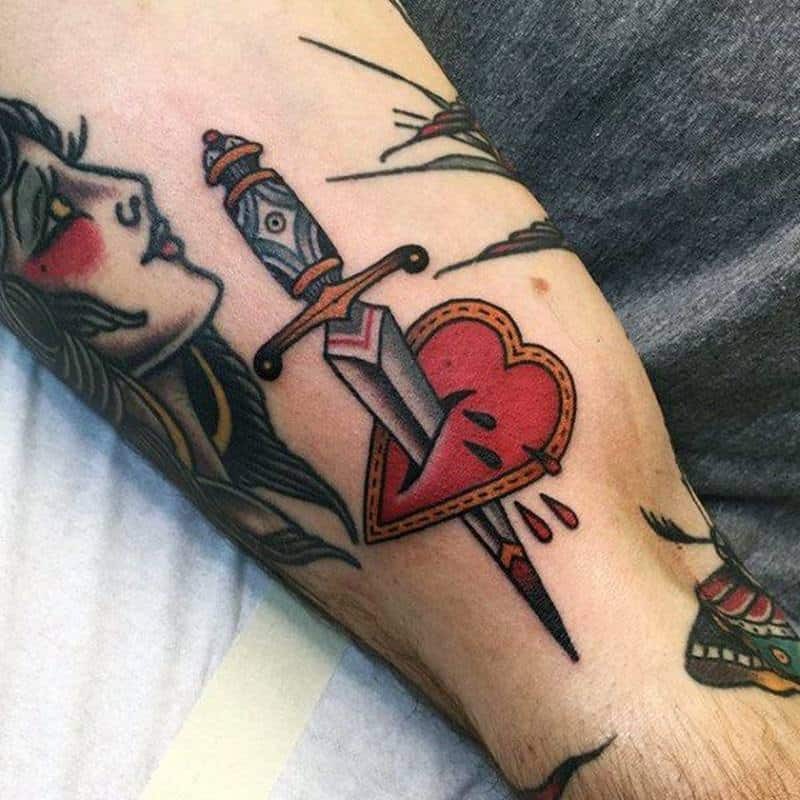 Dagger Piercing a Heart: It could represent the loss of love, a broken heart or betrayal. 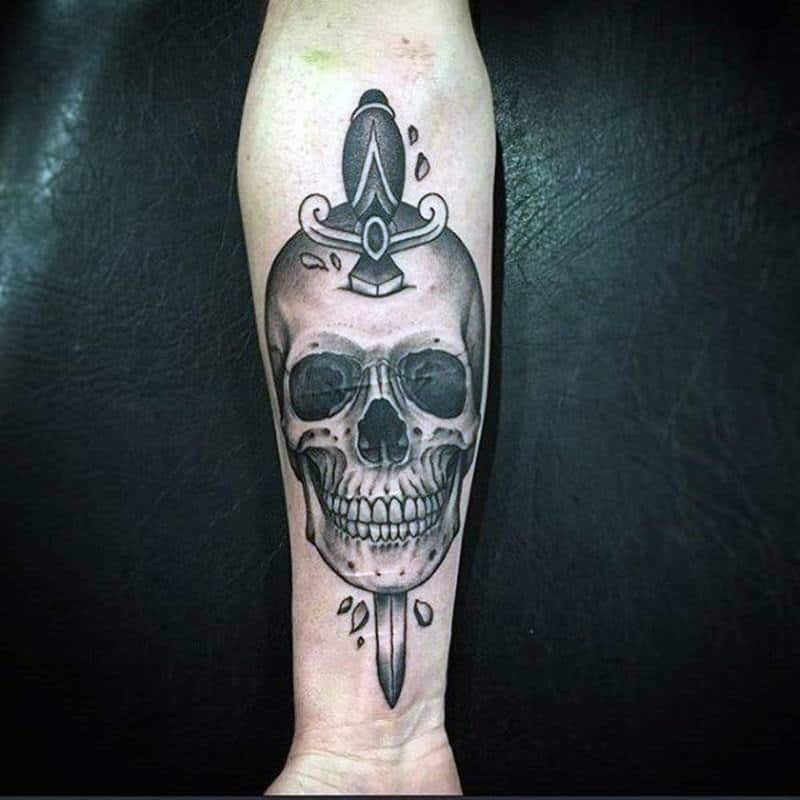 Dagger and Skulls: Sometimes we see the blade piercing the skull and that would represent bravery, death, memory or protection. 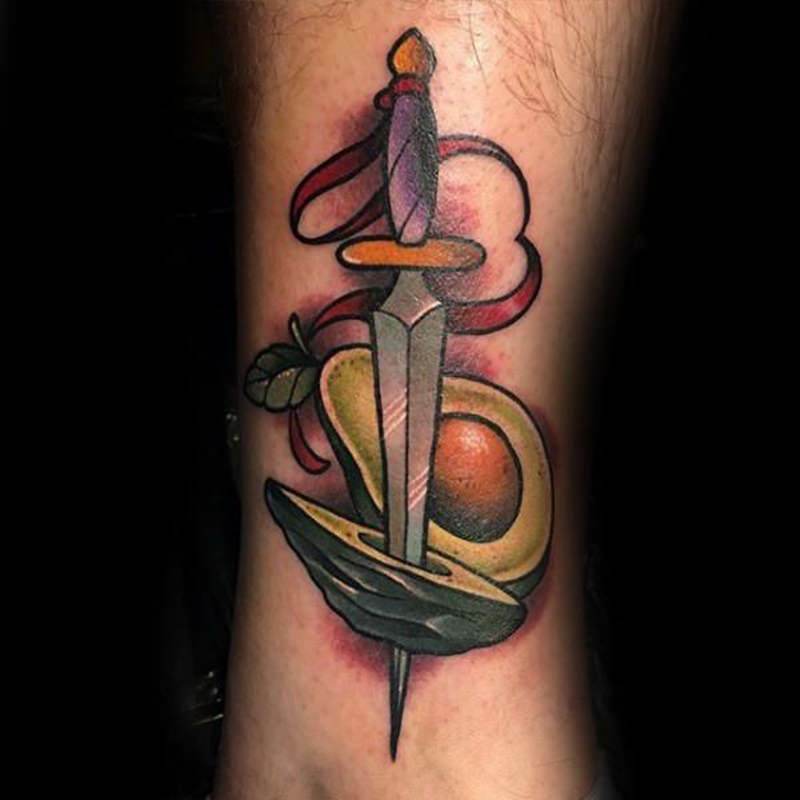 Dagger Piercing Cherries: This is a cool one and it comes from ancient China meaning immortality. 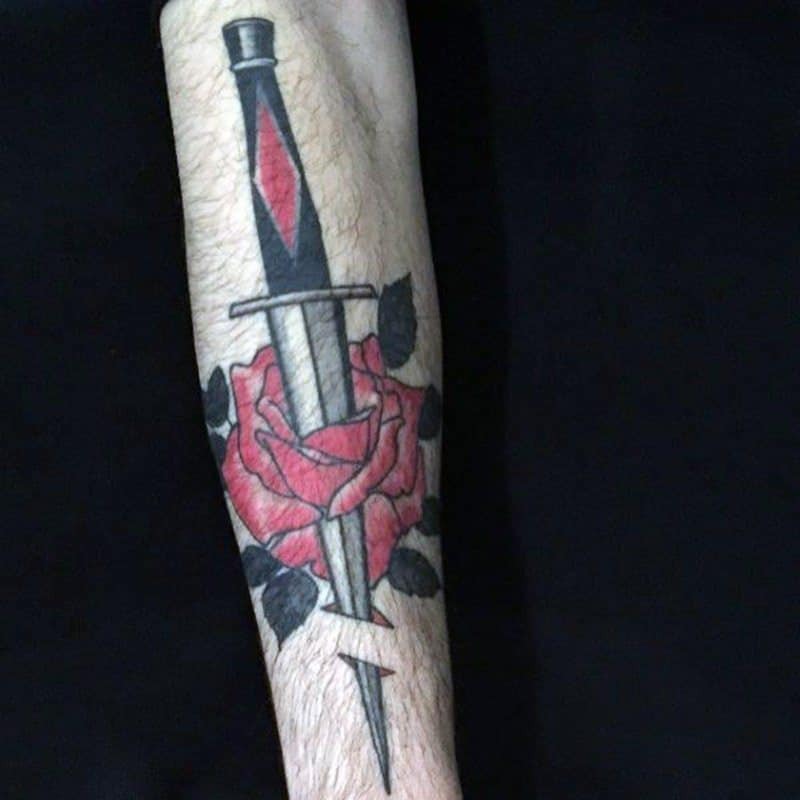 Dagger and Rose: This is a popular option and sometimes we see the dagger piercing the rose but not always. 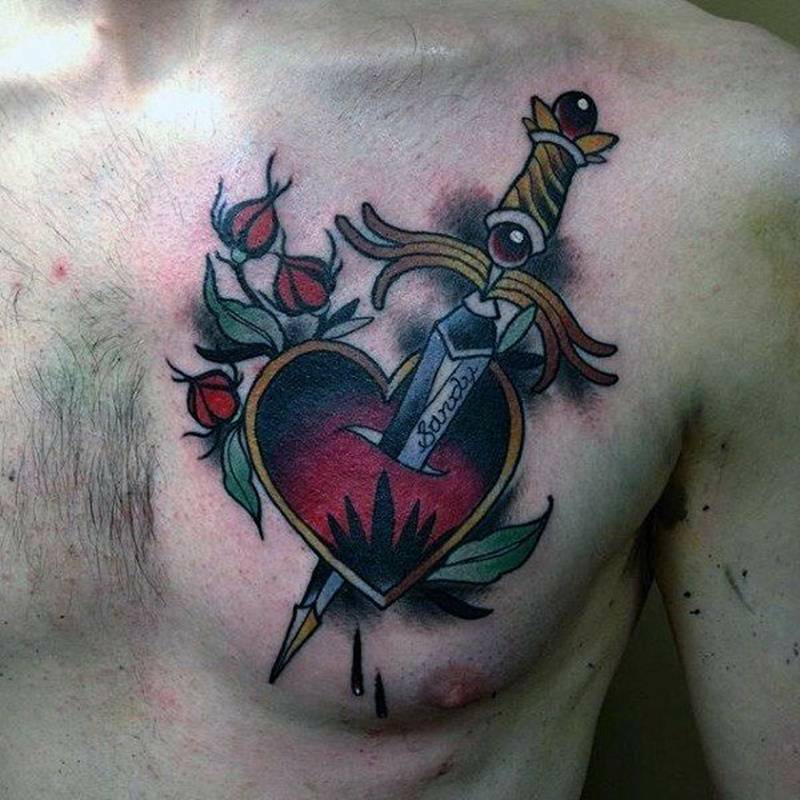 This tattoo represents the harsh realities of life. 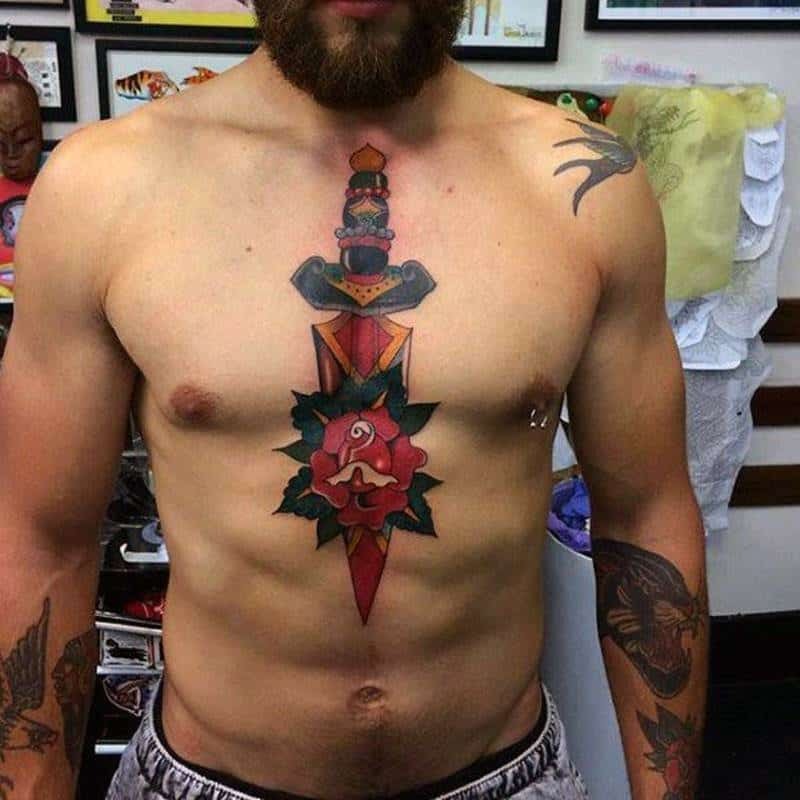 If you have heard the saying, “life is no bed of roses” then you can see where the tattoo meaning comes from. 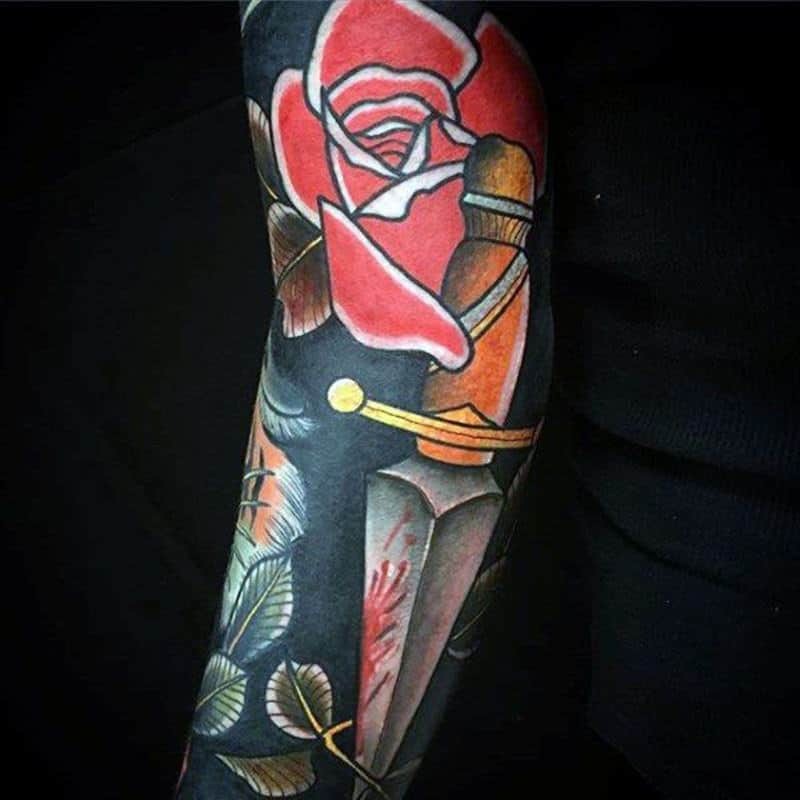 We all need the strength to endure this life and that is what the dagger and rose tattoo mean. 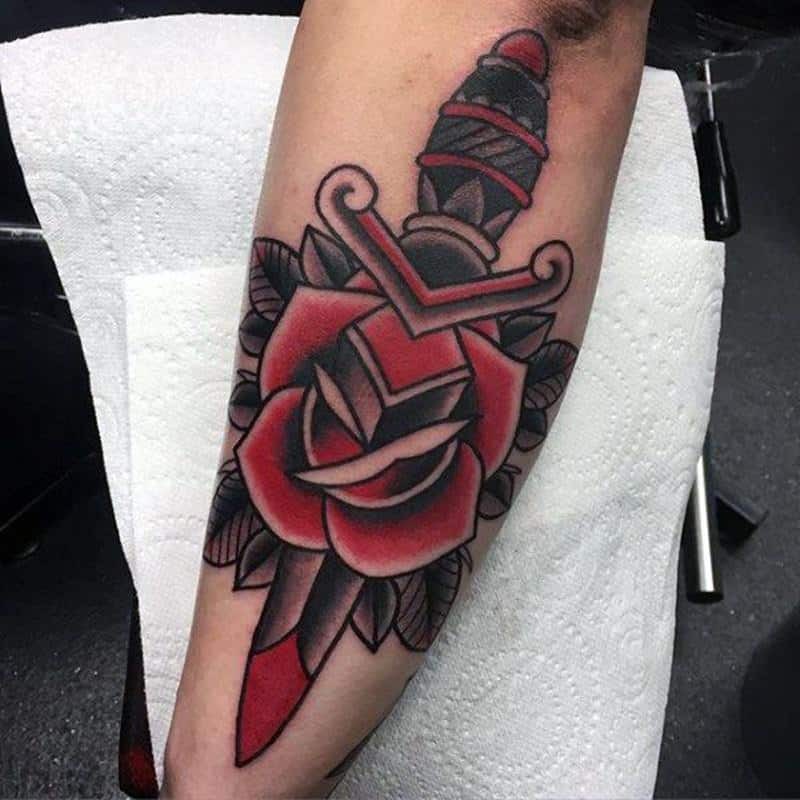 This tattoo is all about strength. 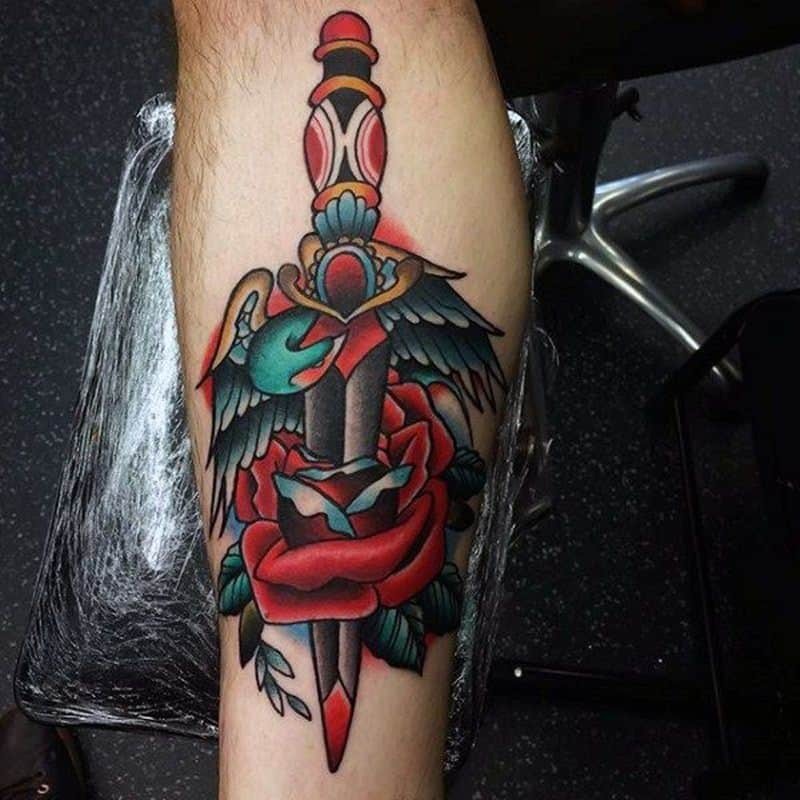 Dagger and Swallow: Swallows are very popular tattoo designs especially with sailors. The swallow itself represents wealth, good fortune, and a safe passage. When you combine the two you could be expressing hope for a safe trip or safe journey. 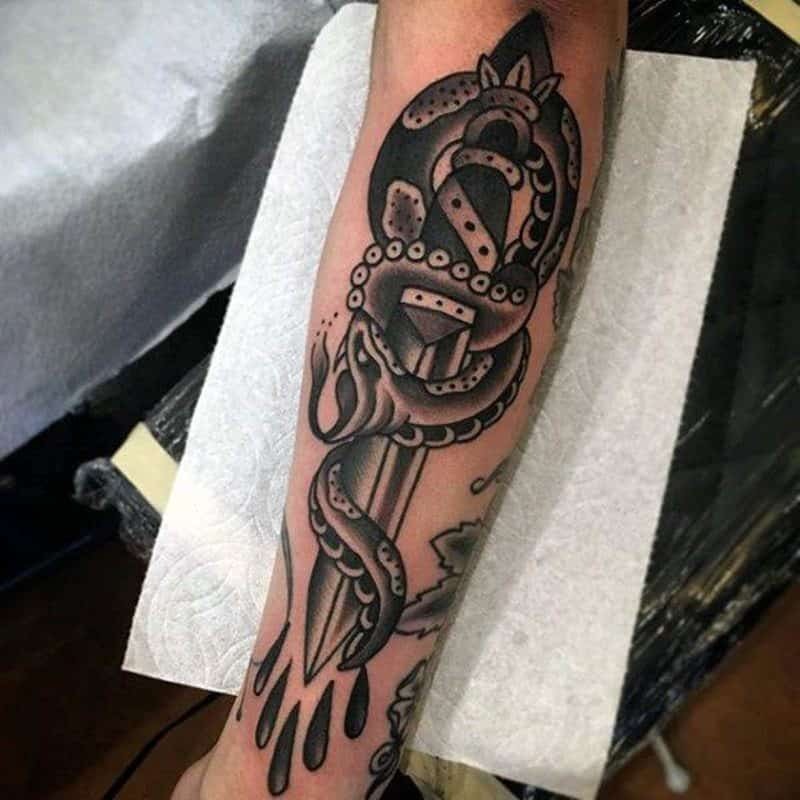 Dagger and Snakes: Snakes and daggers usually represent an association with the Roman God Mercury. 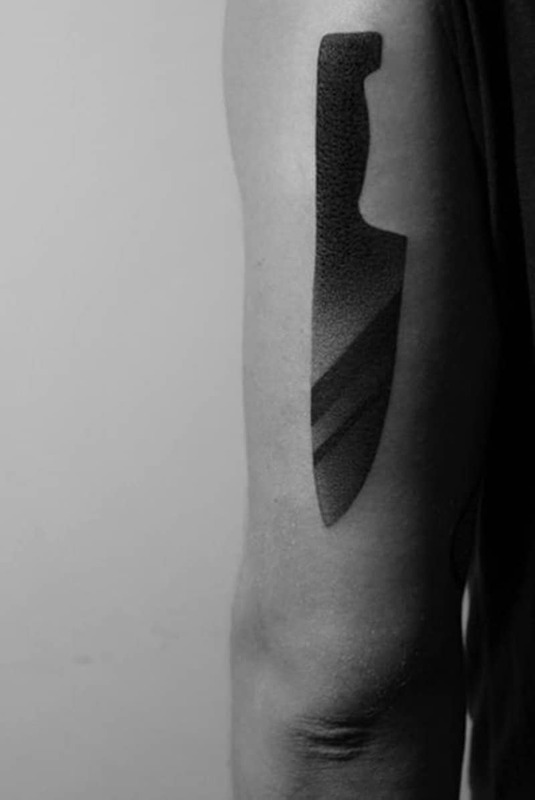 Bloody Dagger: This is more of a meaning of sacrifice or spilled blood. 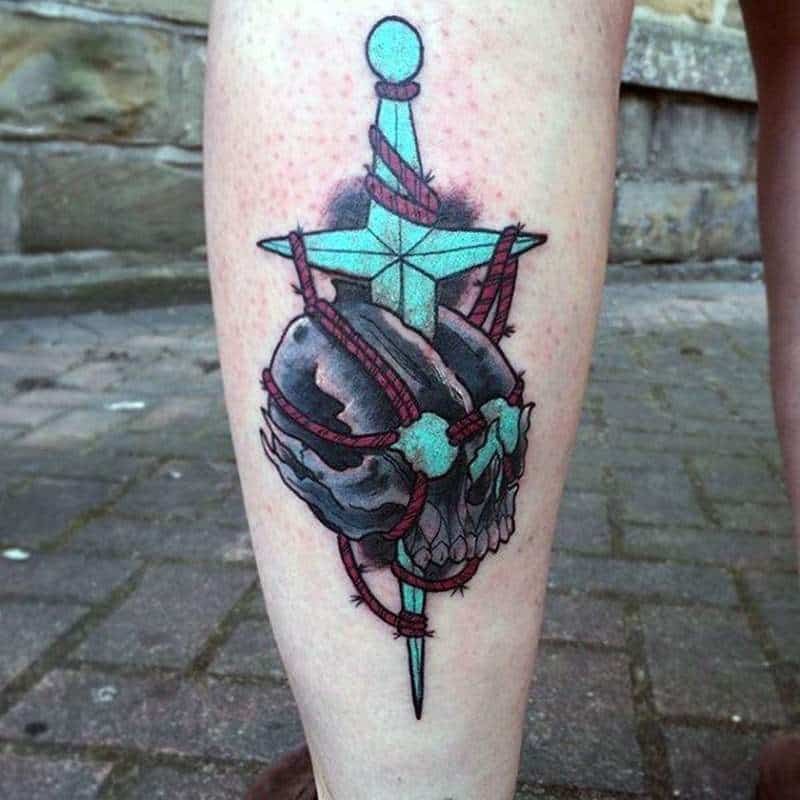 It can represent death alone or to represent a battle that was fought. 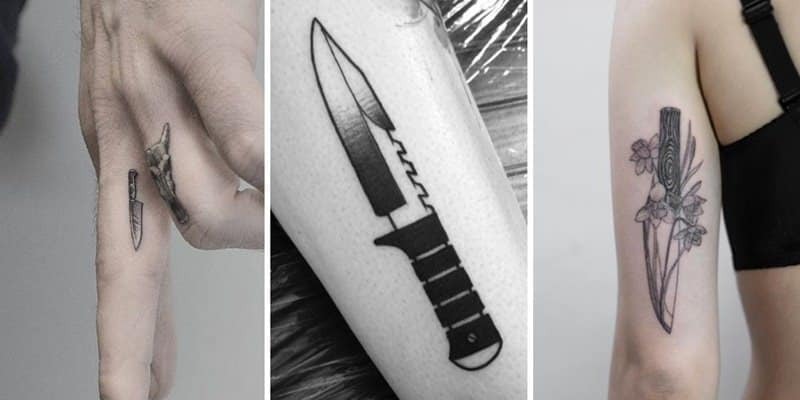 These are just a few of the variations of dagger tattoos that you can get. 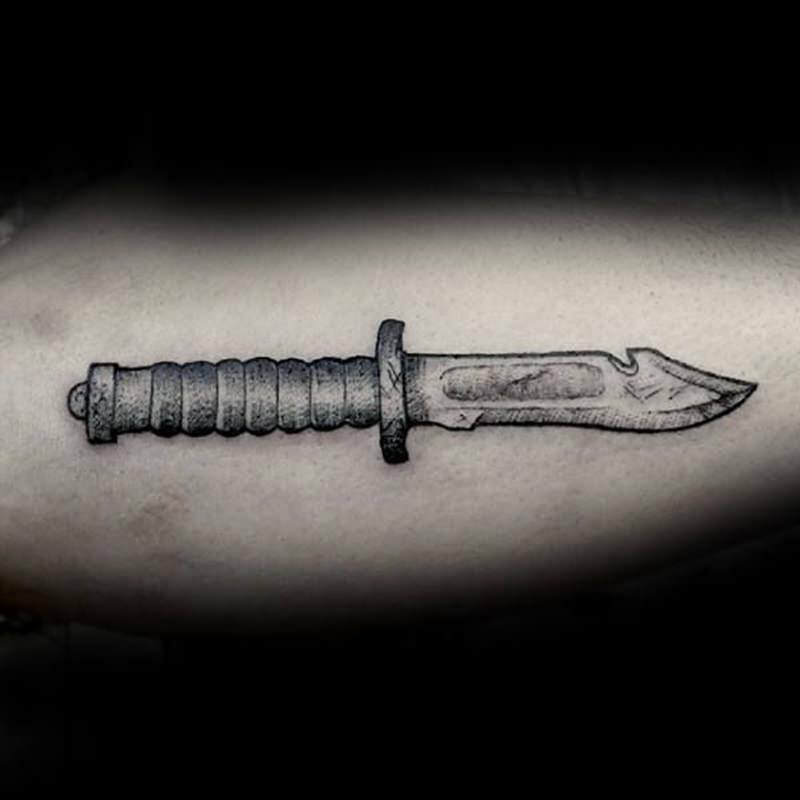 The dagger is generally known to be a weapon of battle and one that is used in sacrifices. 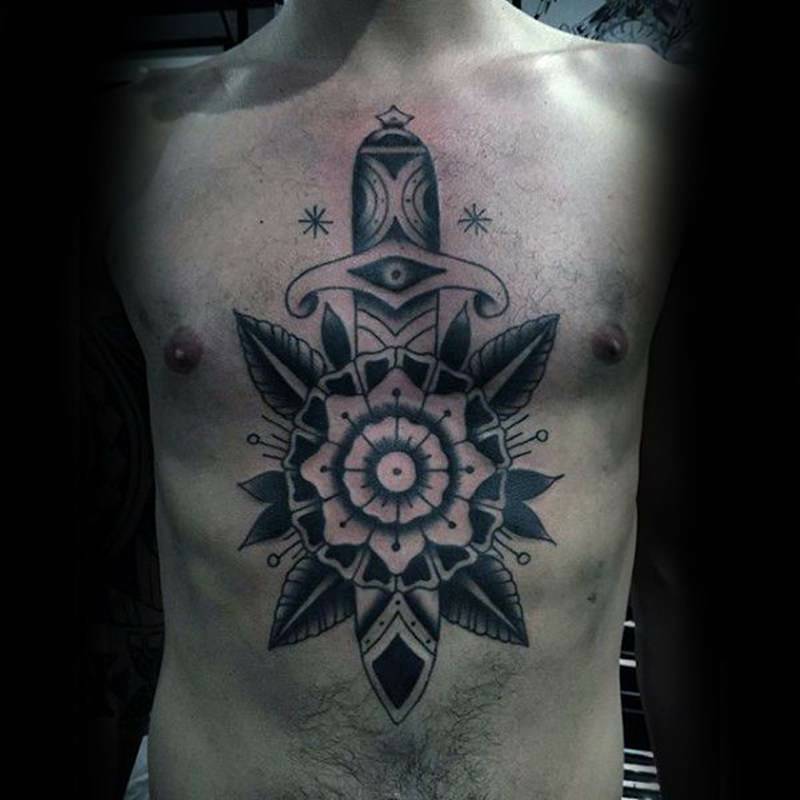 If you are looking for a big tattoo design, then you can’t go wrong with this one. 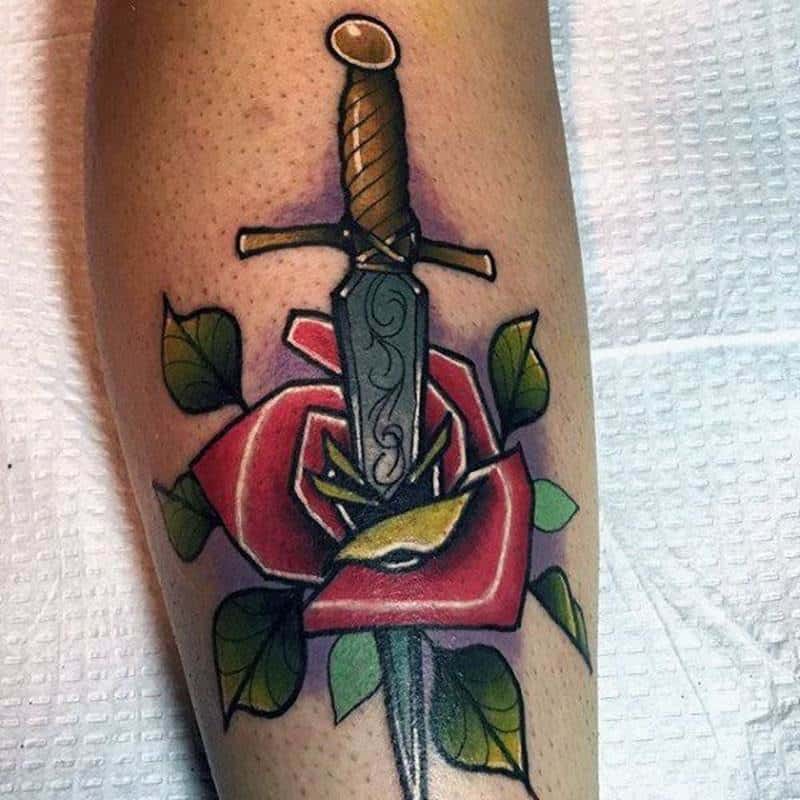 In this case, it’s not a rose that the dagger is piercing but a flower. 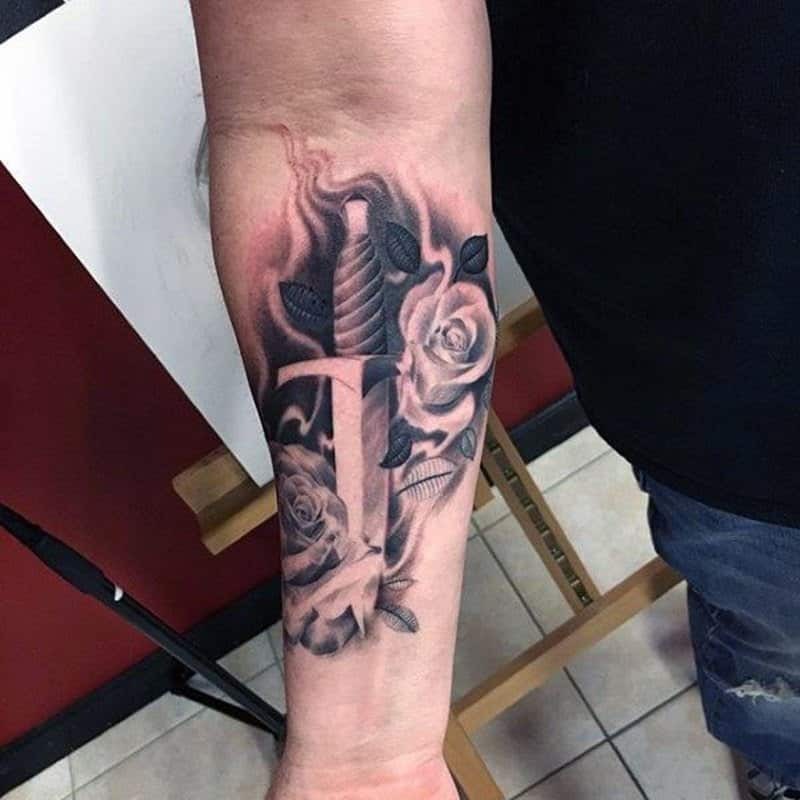 This tattoo is a little more detailed than most which means that you are getting a look that comes across as more dangerous. 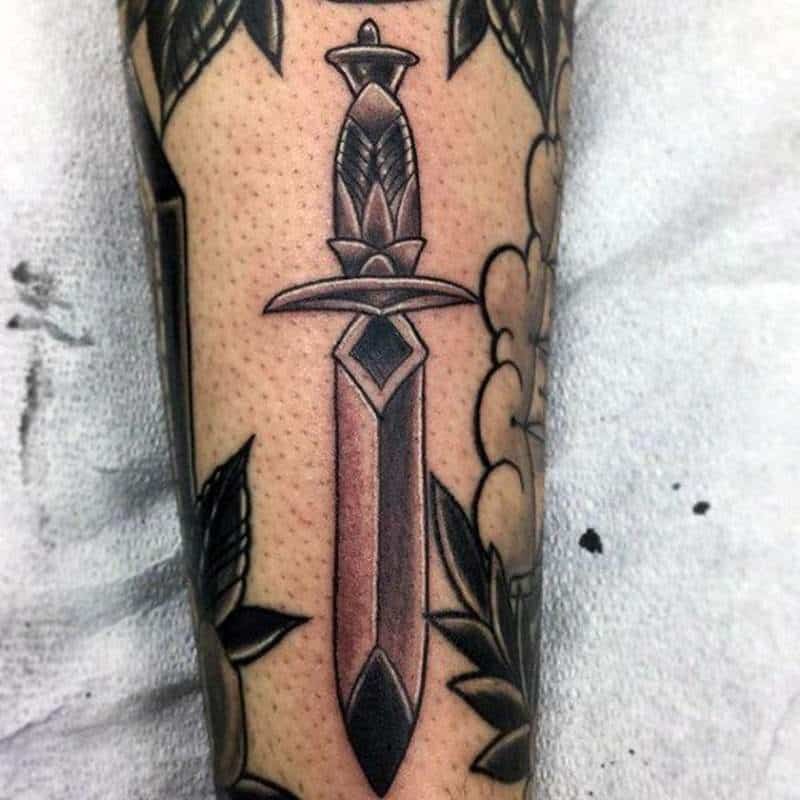 This is one of the more peaceful looking dagger designs that we’ve seen. 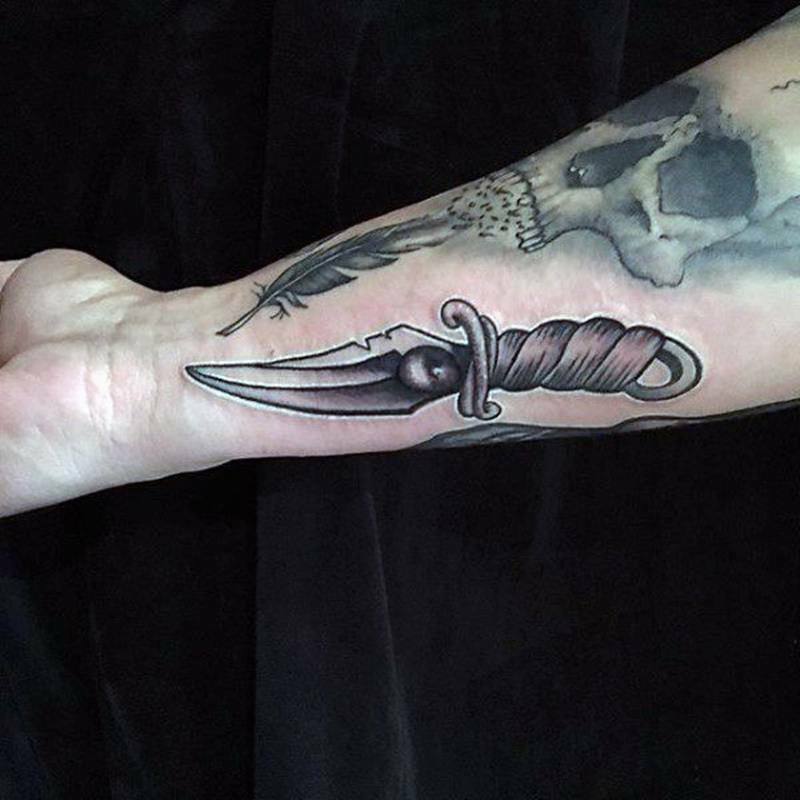 Here we have one of the dagger and skull tattoos where the dagger is piercing the skull. If it’s supposed to represent death, then the bright blue coloring is certainly throwing us off. If that’s the look you are going for and the meaning behind it, you might want to try a different color. 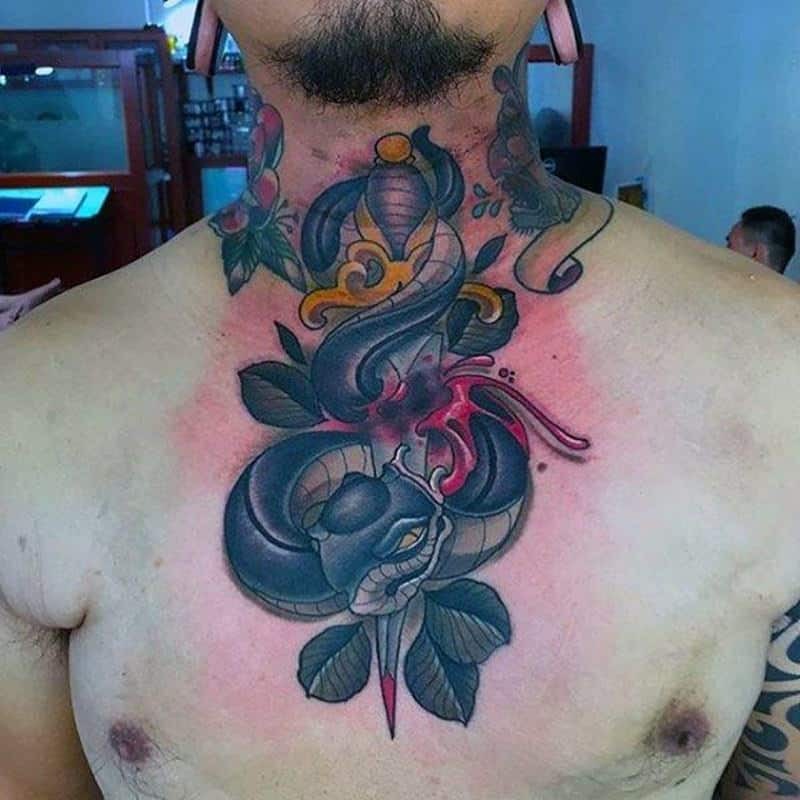 There is a lot going on with this tattoo style. 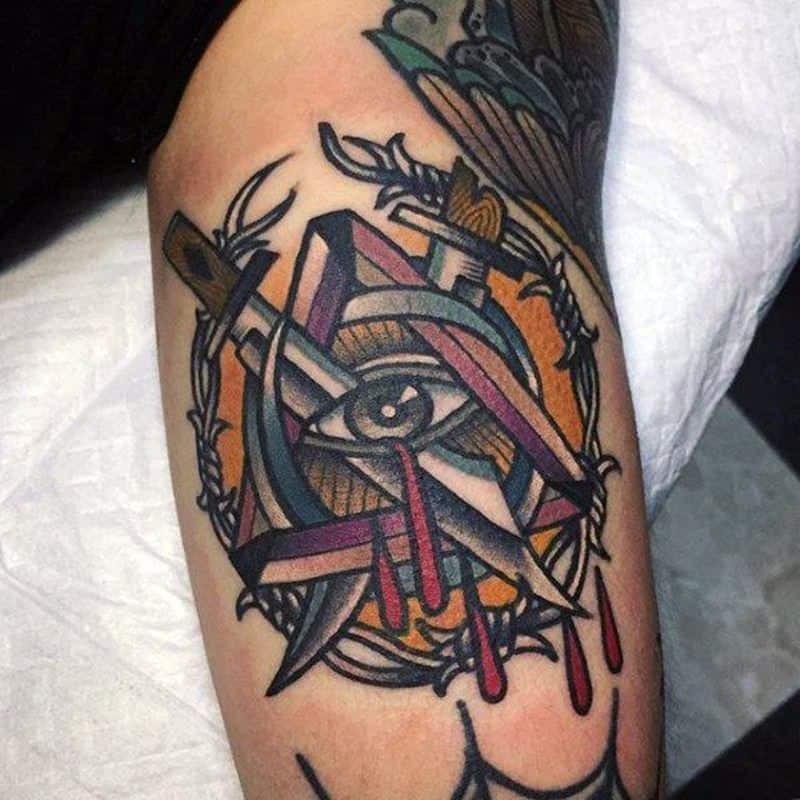 We have pyramids, blades, the all-seeing eye as well as many other elements. 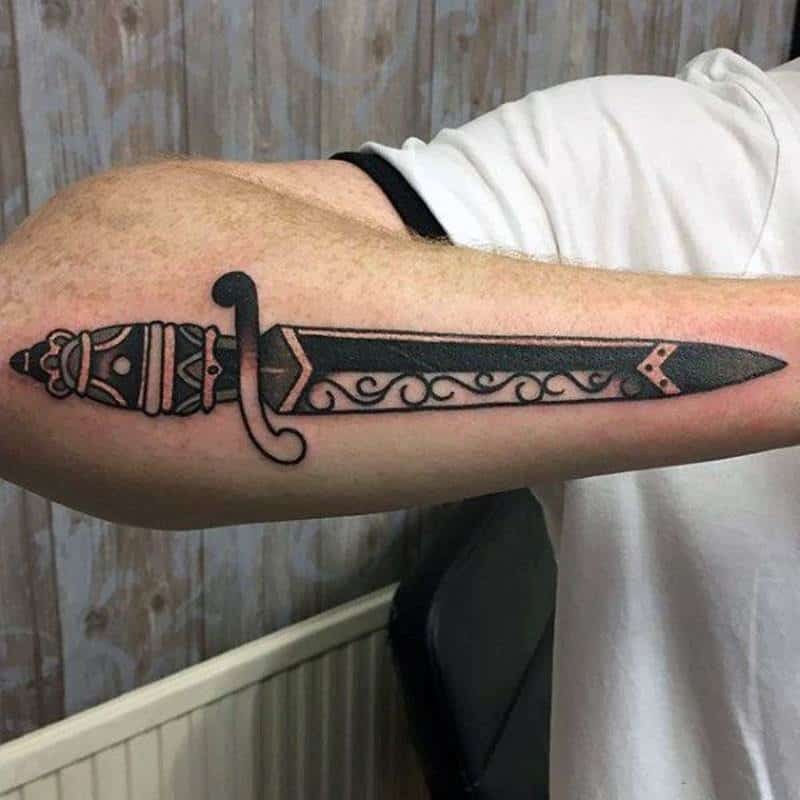 This is certainly no dagger and it’s more of a sword than anything. 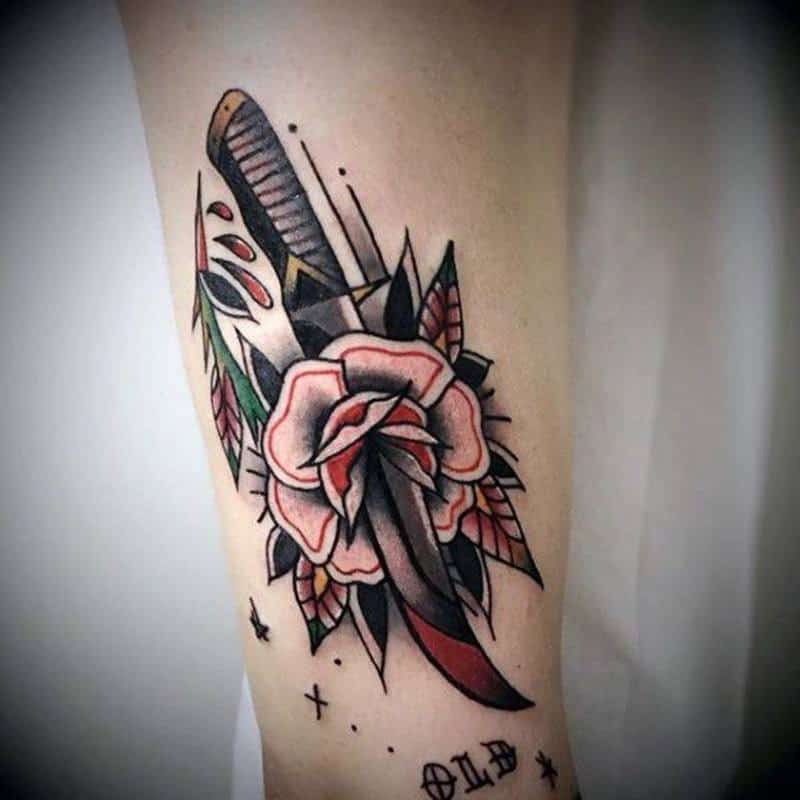 If you are looking for a cool design, then this is the one for you. This is certainly an intriguing design and one that holds a lot of mystery. 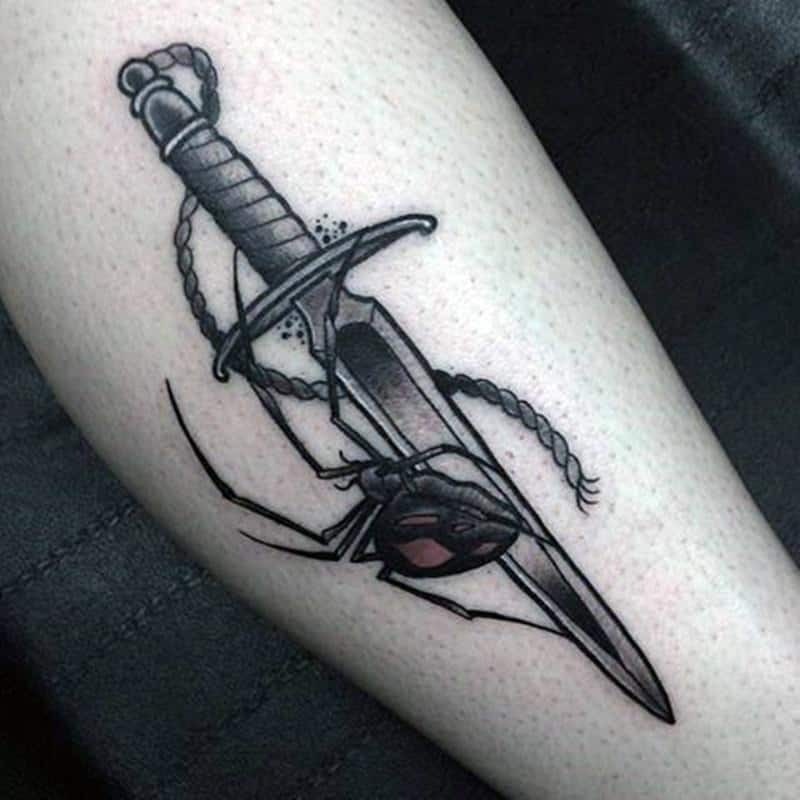 We love the delicate legs of the spider and how it’s walking up the blade. 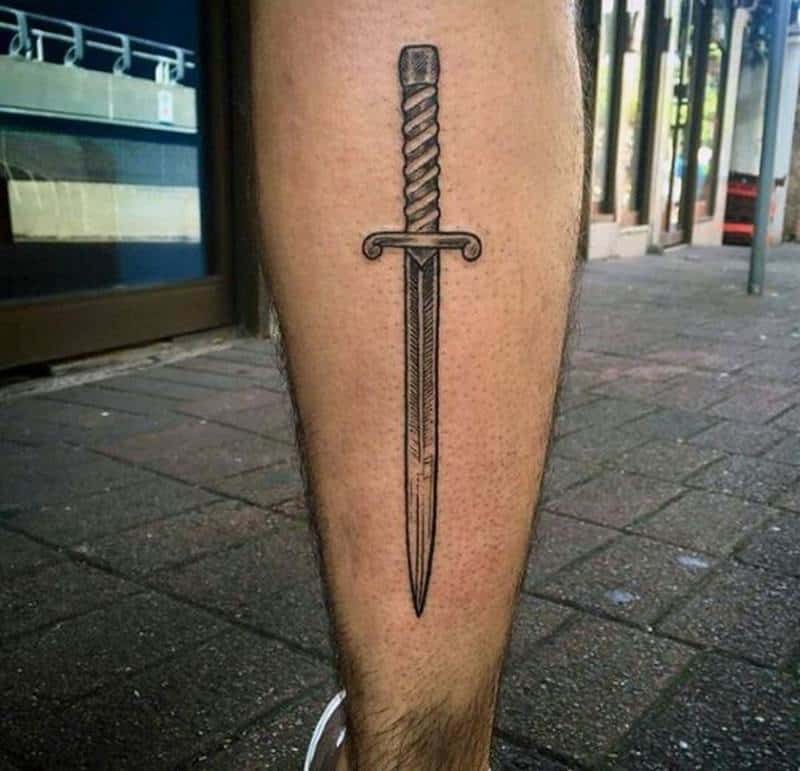 If you are looking for a conversation piece, then try this tattoo out. 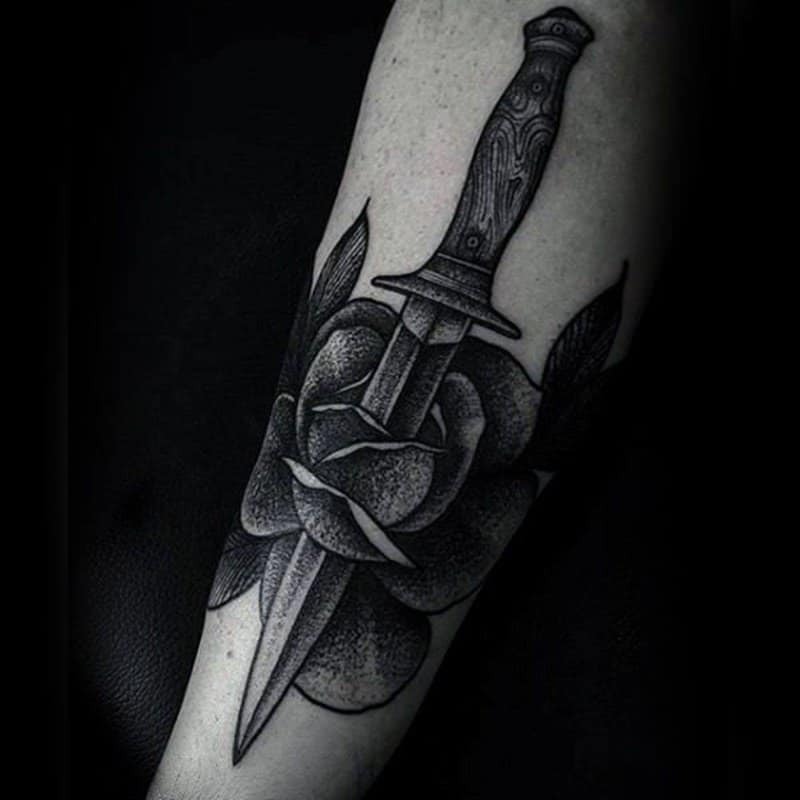 This is another floral tattoo design with a dagger and it has a lot more ornate designs to it than the other ones. 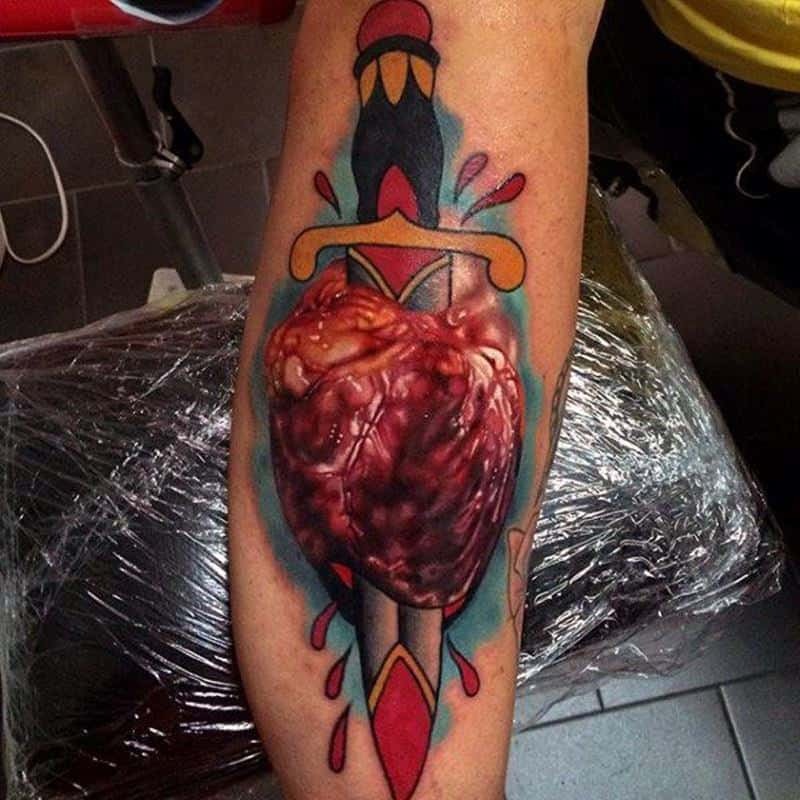 This tattoo could easily represent a battle that was fought and won. 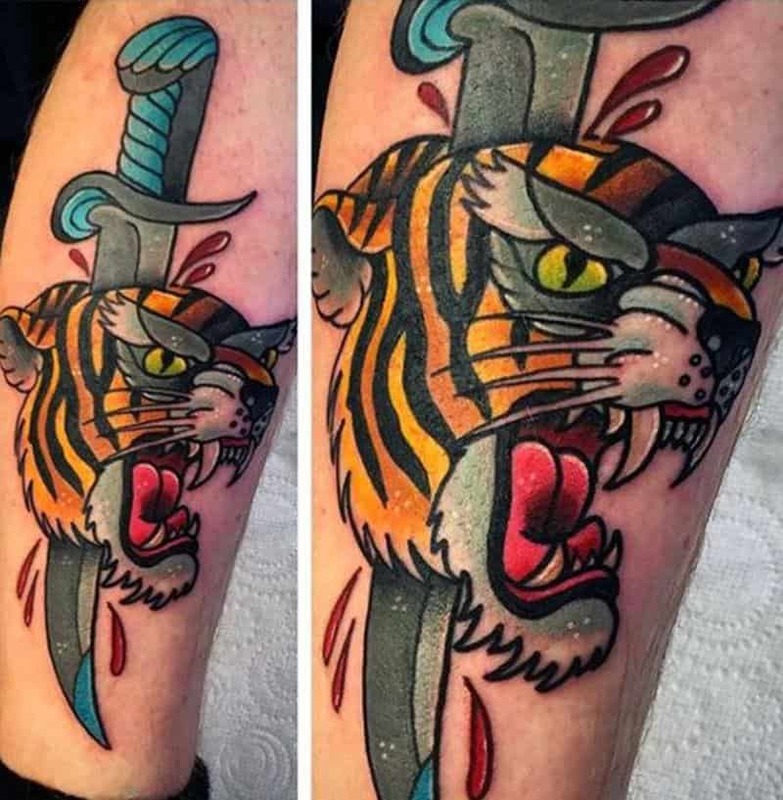 We have the tiger’s eye being pierced by the blade in this badass tattoo design. 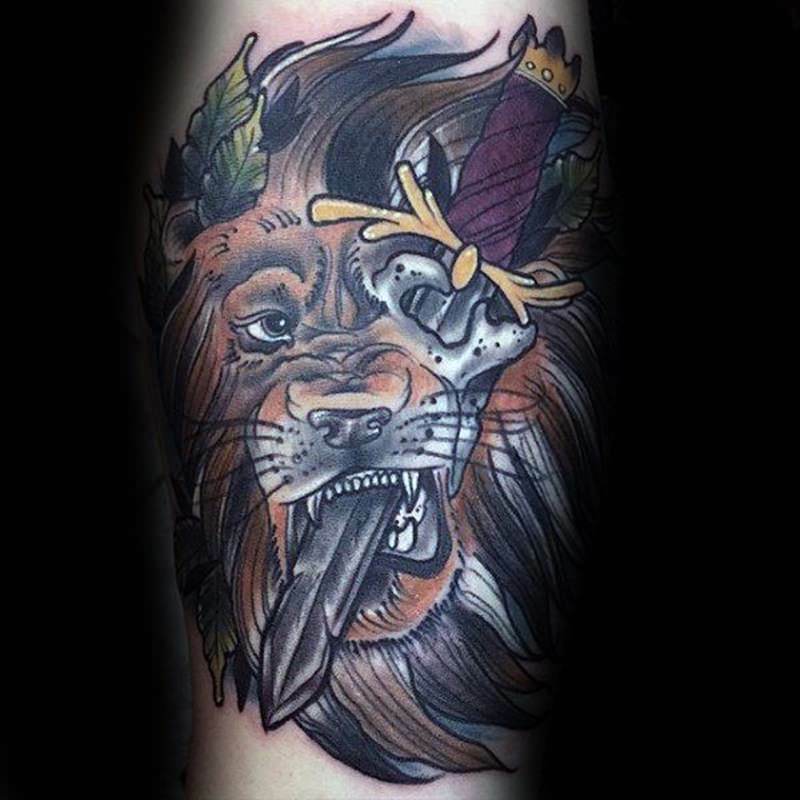 This is another tattoo design that shows off some cool imagery. 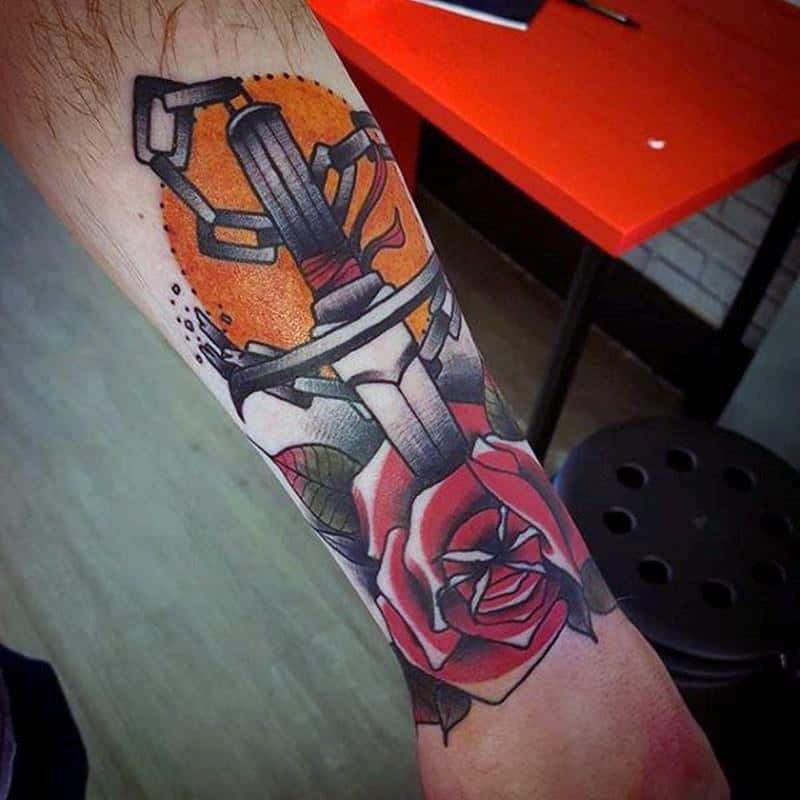 We see the blade as well as a pirate ship on the inside. 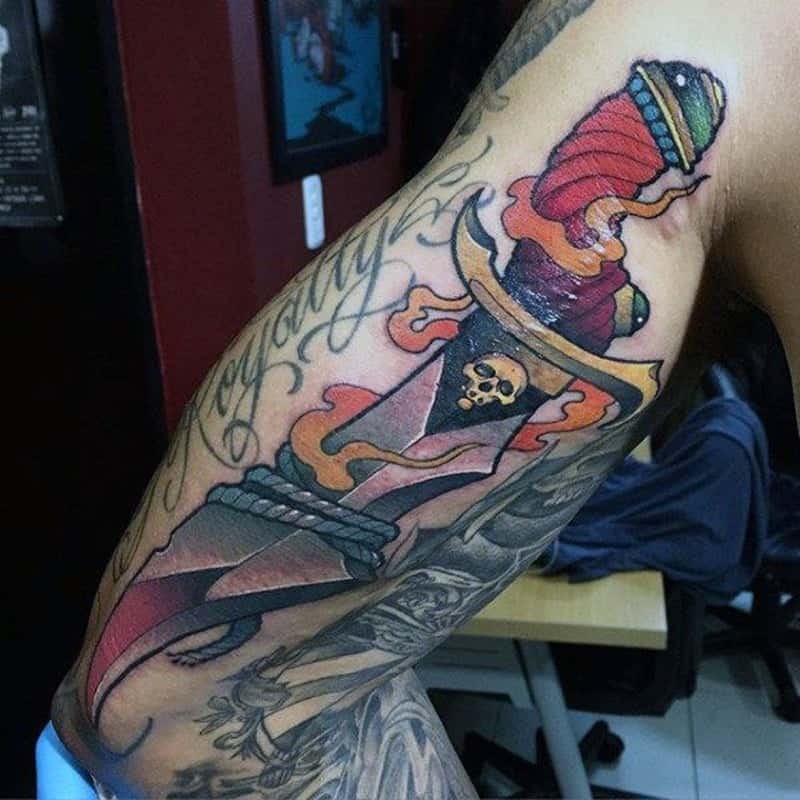 Who doesn’t want a life of a pirate at sea? 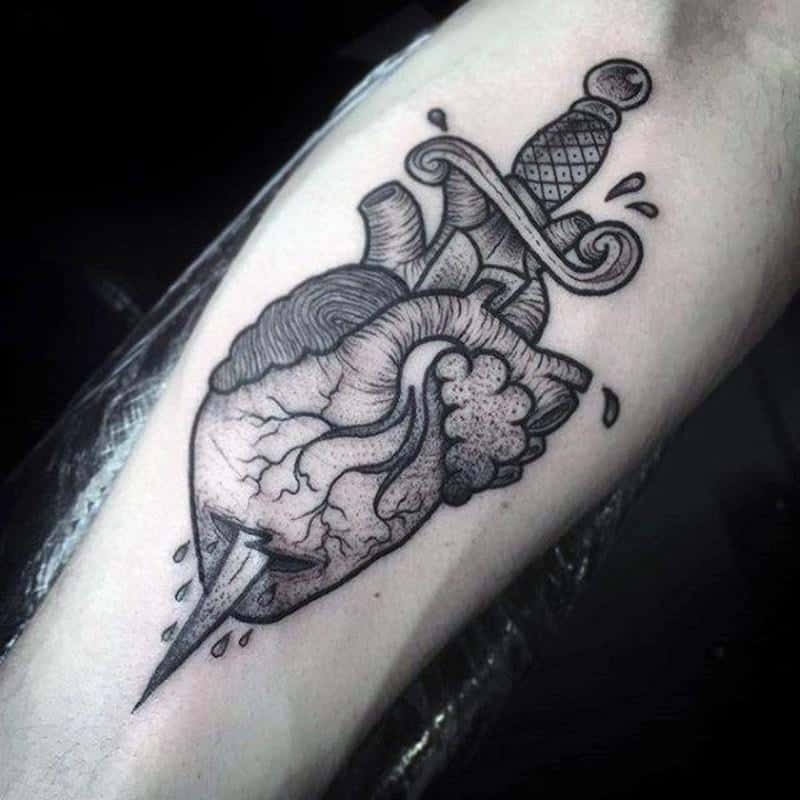 This tattoo design is detailed and it’s showing you exactly what a broken heart feels like. 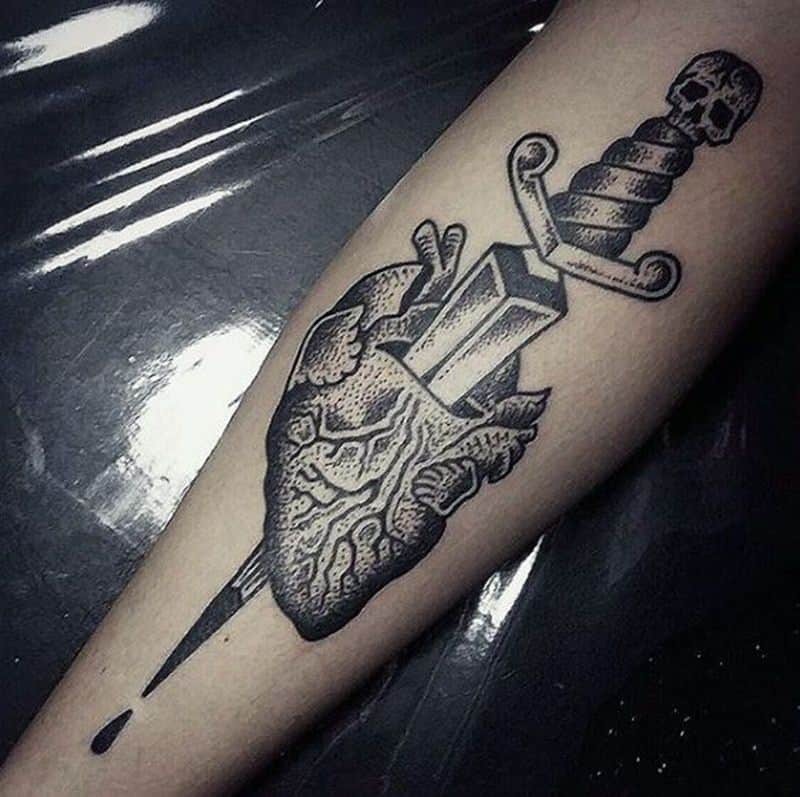 It could be representing a betrayal that will always be fresh in the heart. 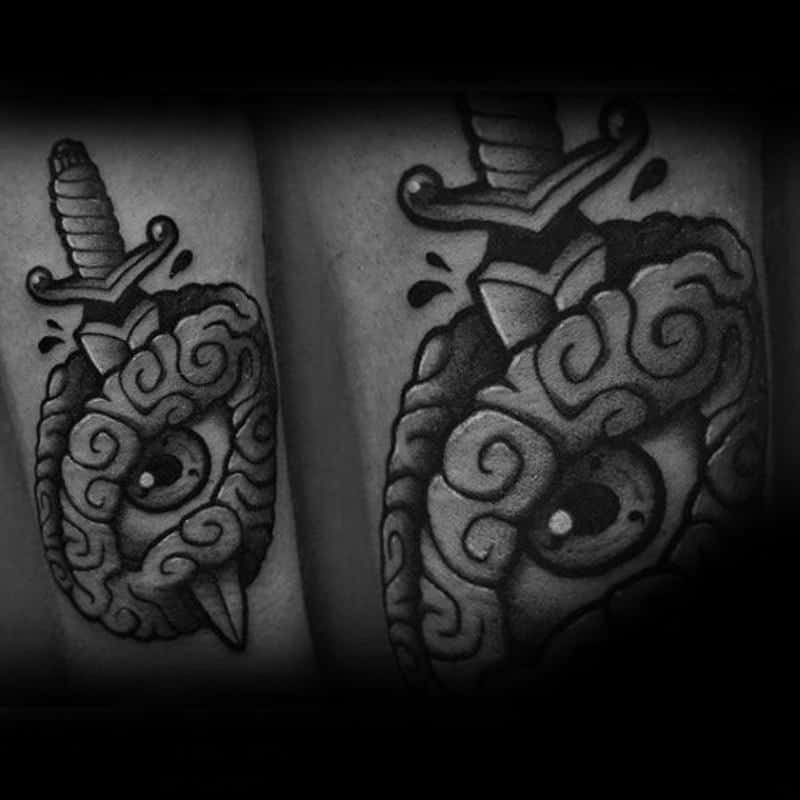 There are multiple animal heads being pierced by the blade and it could once again be representing a battle at hand. It’s hard to say why there are avocados in this photo but it could have a lot to do with prosperity and a fruitful life. 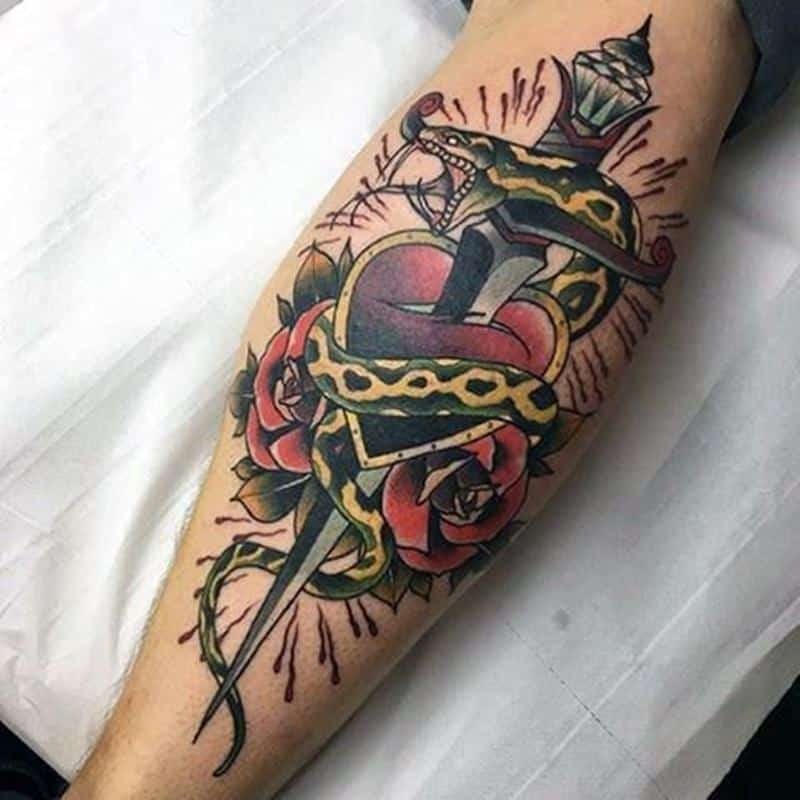 We see the snakes and daggers in this photo and it’s a great example of what you can do to add some mystery to your tattoo. 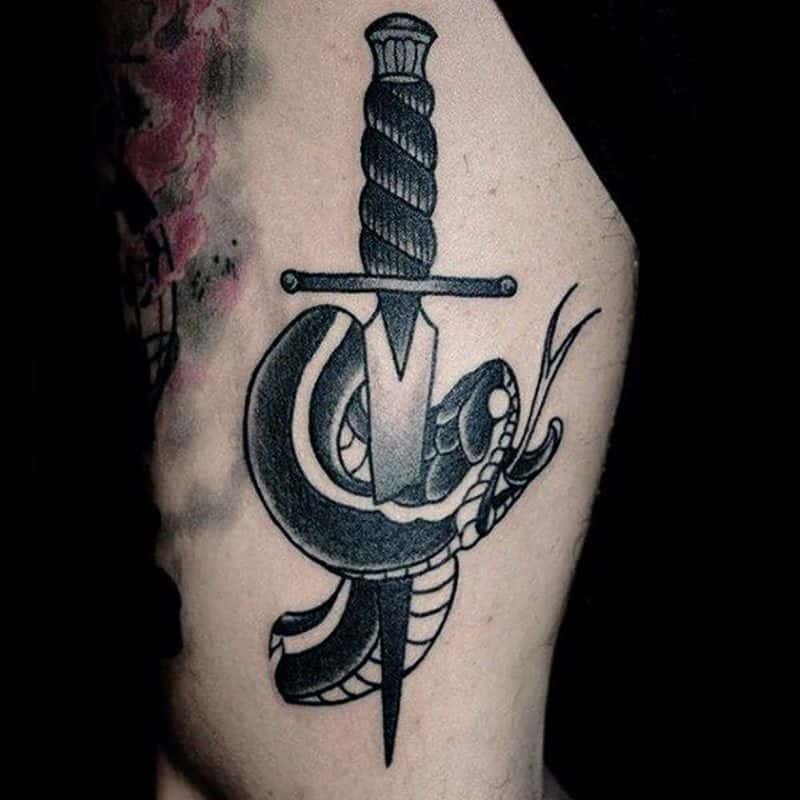 Snakes also represent disceit and betrayal. 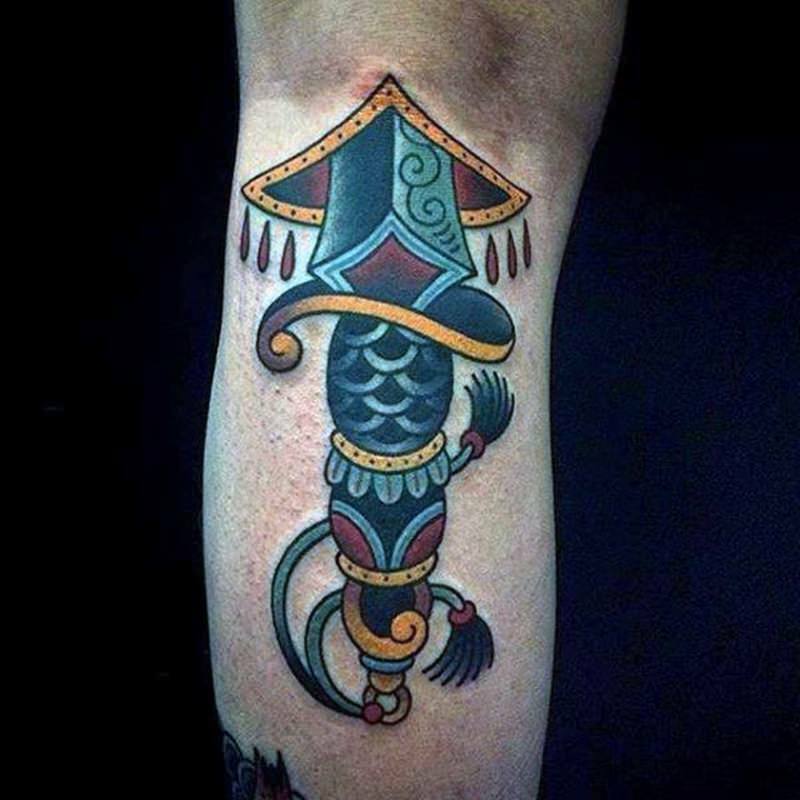 We are mentioning this tattoo because of the bright colors involved. 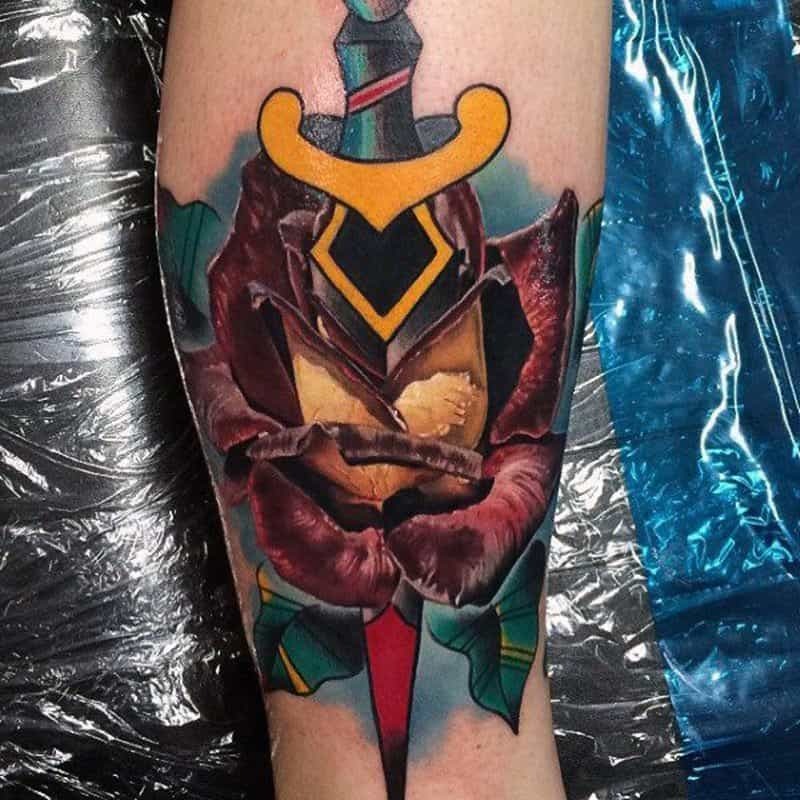 We have seen a lot of dagger and rose tattoos already but this one stands out because of the colors. 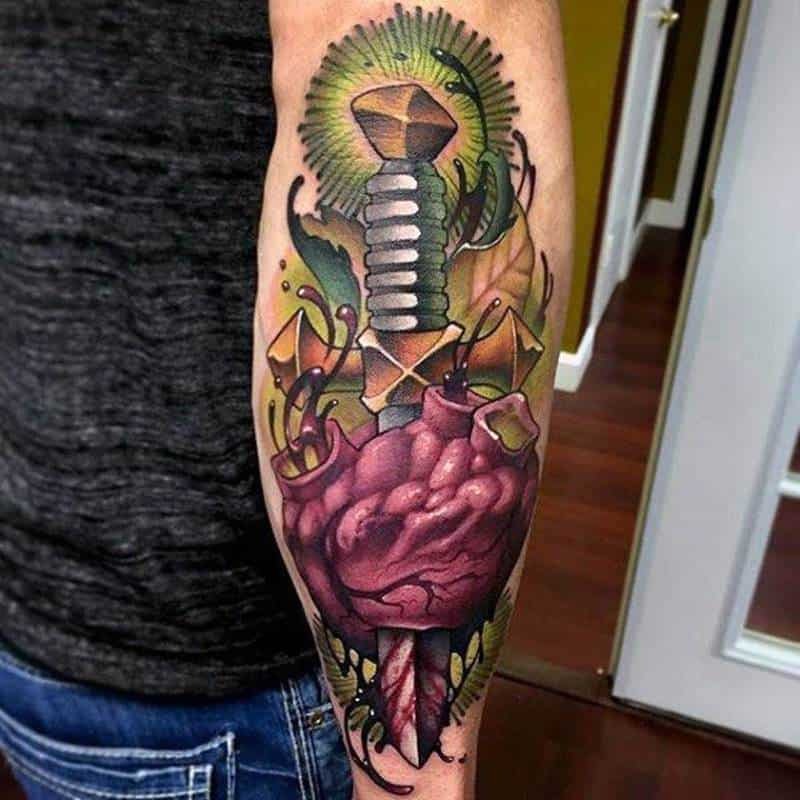 If you are looking for something that is one of a kind, then you can’t go worng with this tattoo. 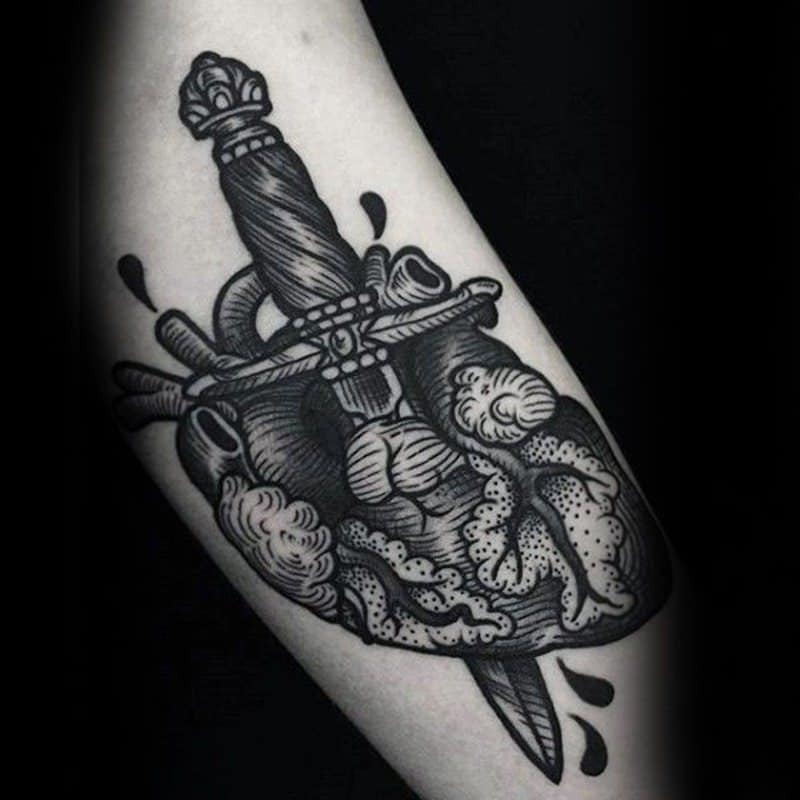 This would be a great tattoo design for the arm because it’s slim and narrow. You may be looking for something different then the ornate designs that we have already seen. 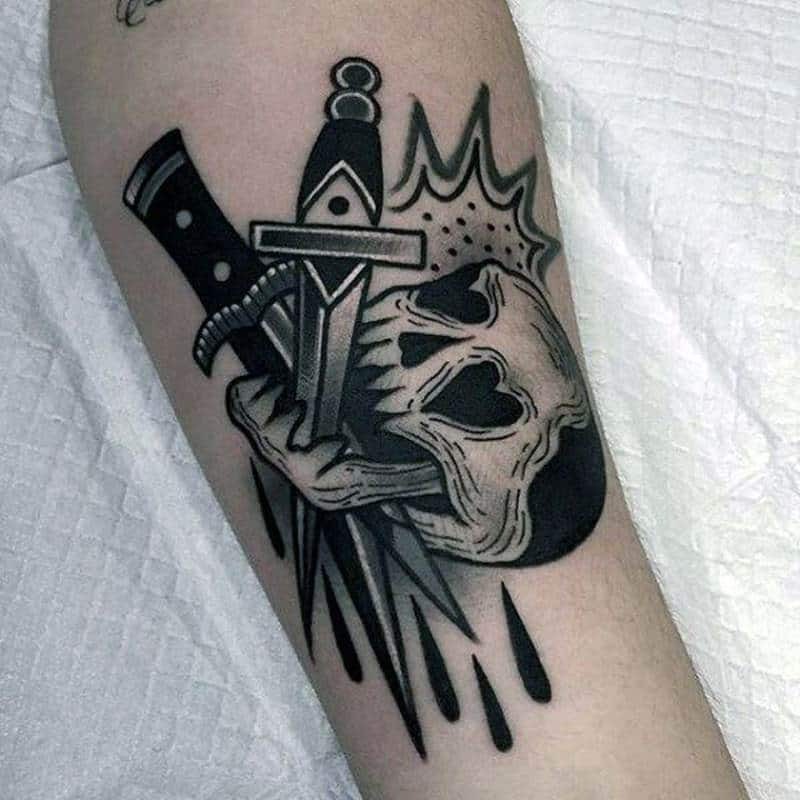 This is a badass design that will get the message across. 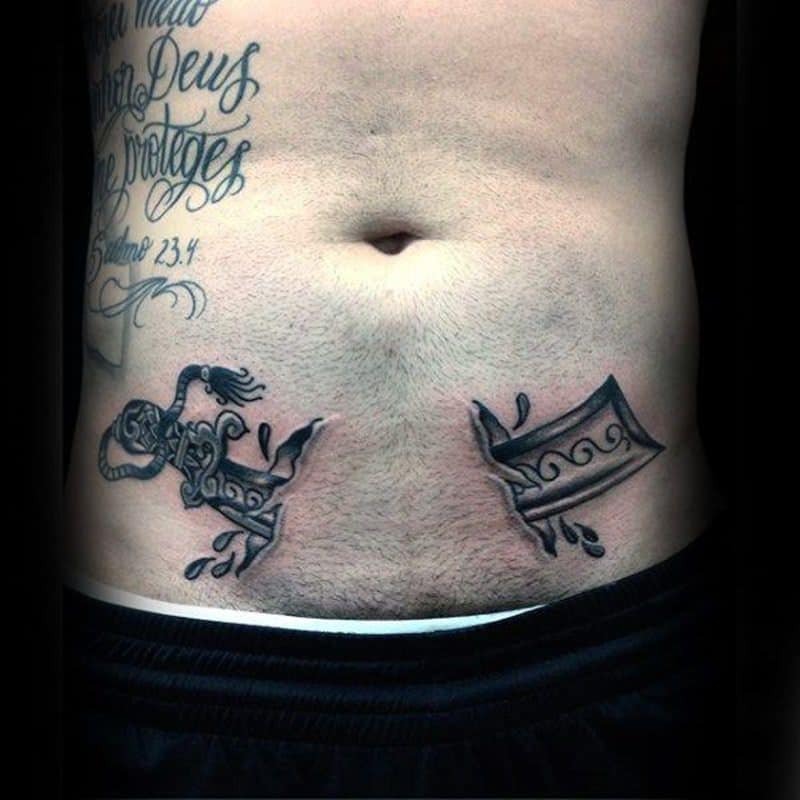 If you have a sense of humor, then this might be the tattoo design for you. 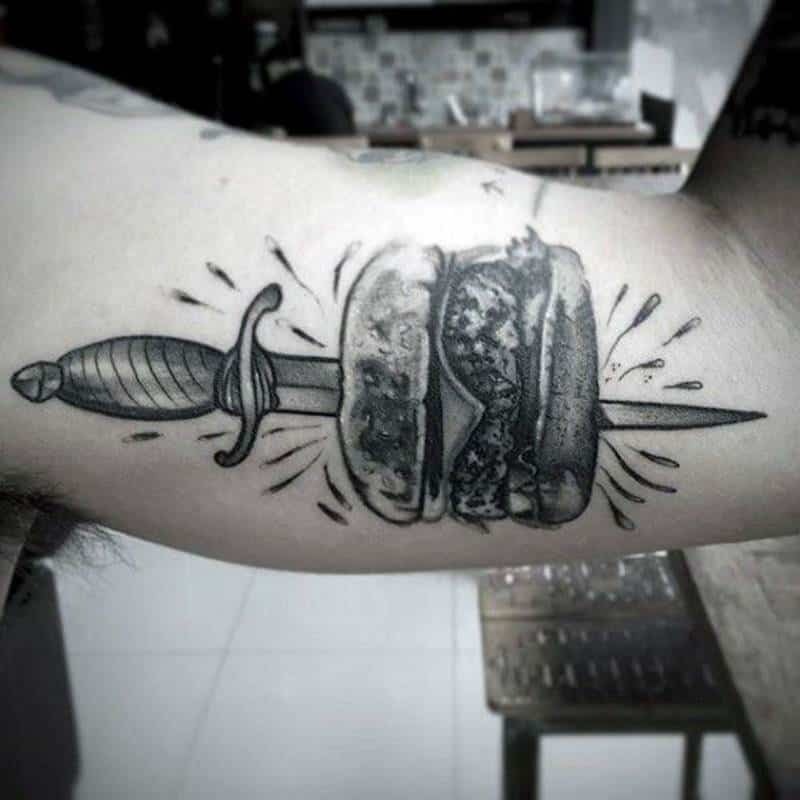 We love all the detail involved with the burger. If burgers are your favorite, then try this style out. 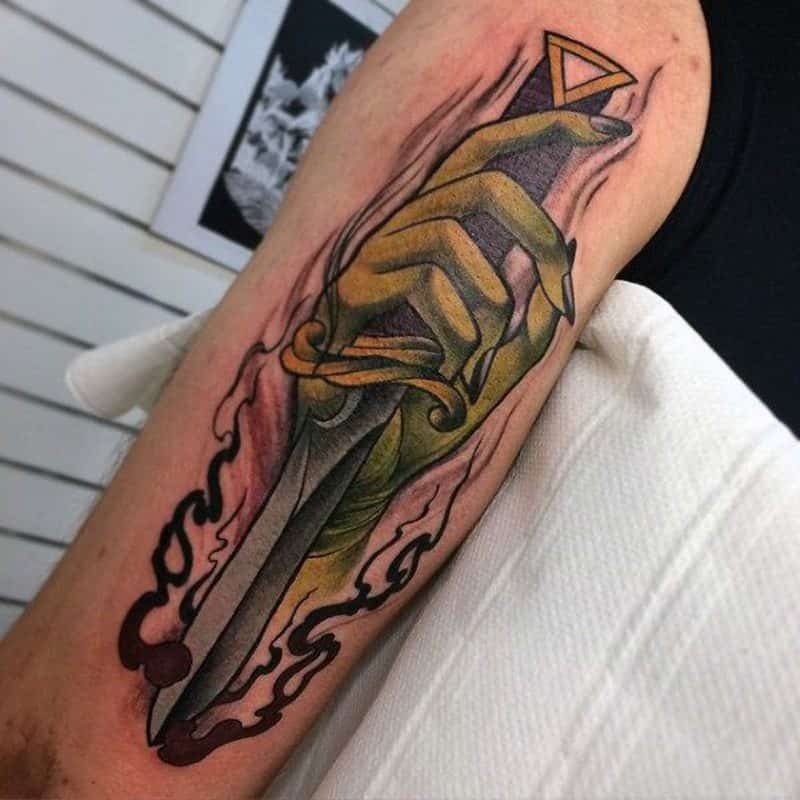 It looks like there is something sinister grabbing a hold of this blade and we have to wonder what it is. A great style that you are sure to love. 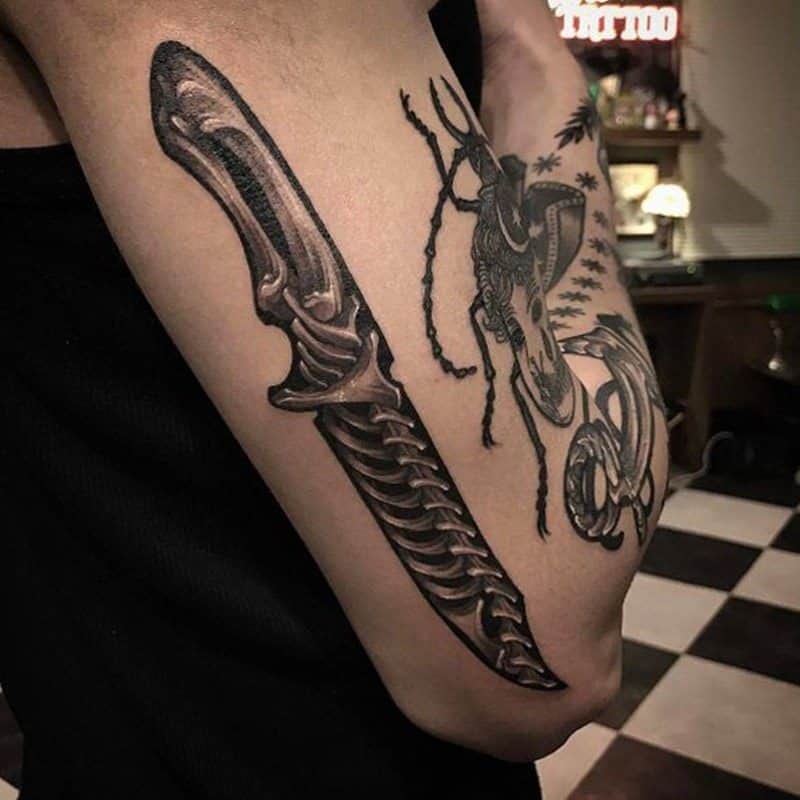 It’s badass and a little gross all at the same time. 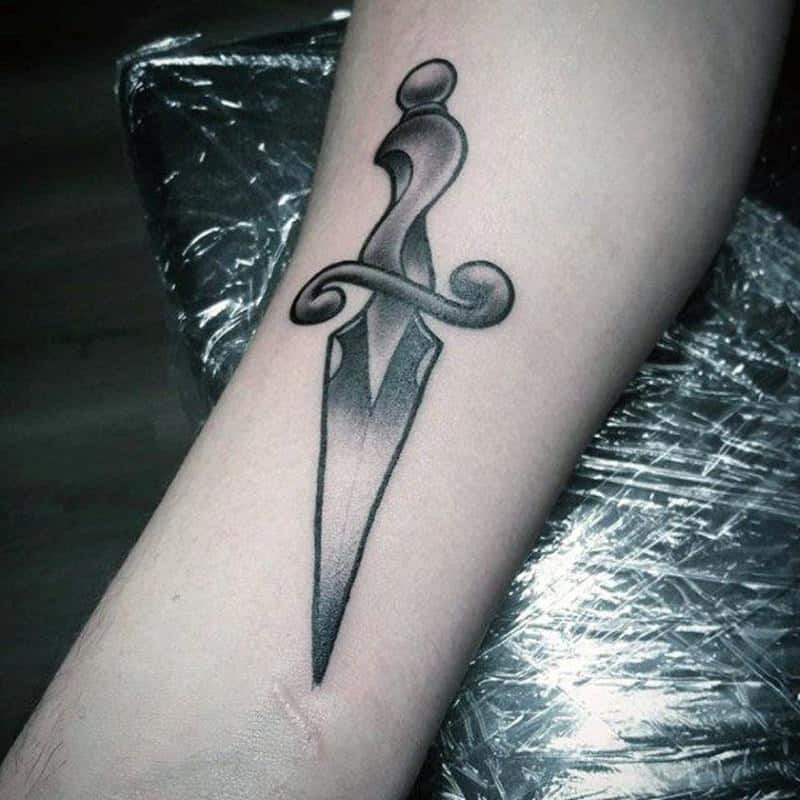 It looks like the dagger is piercing the eye but is it getting brain as well. 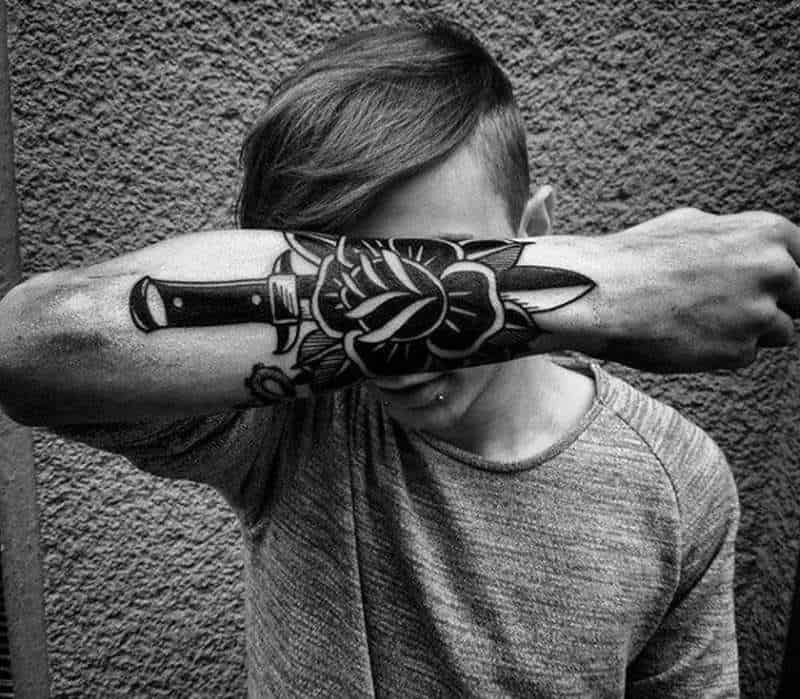 This cool design is sure to have people talking. 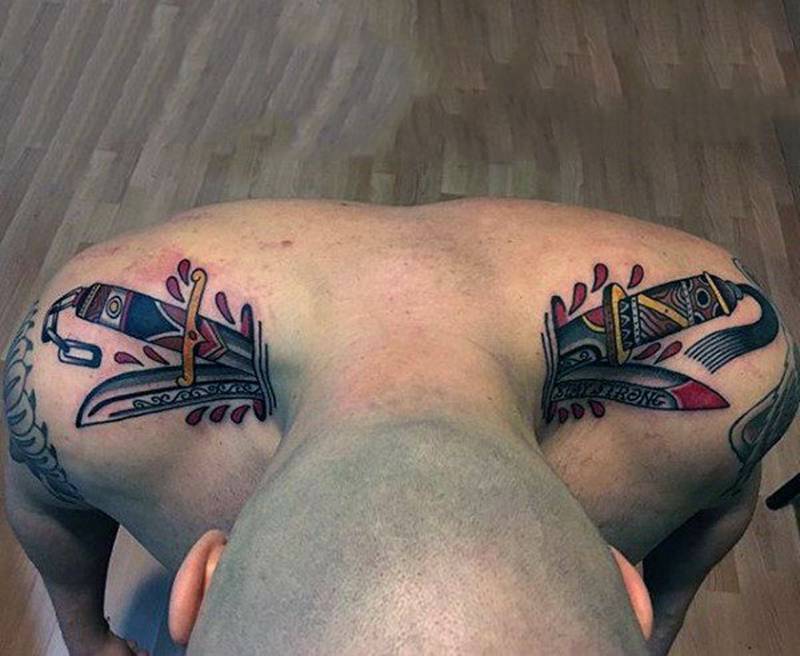 The tattoos are placed on eiether side of the neck and they look like they are embedded in the neck. 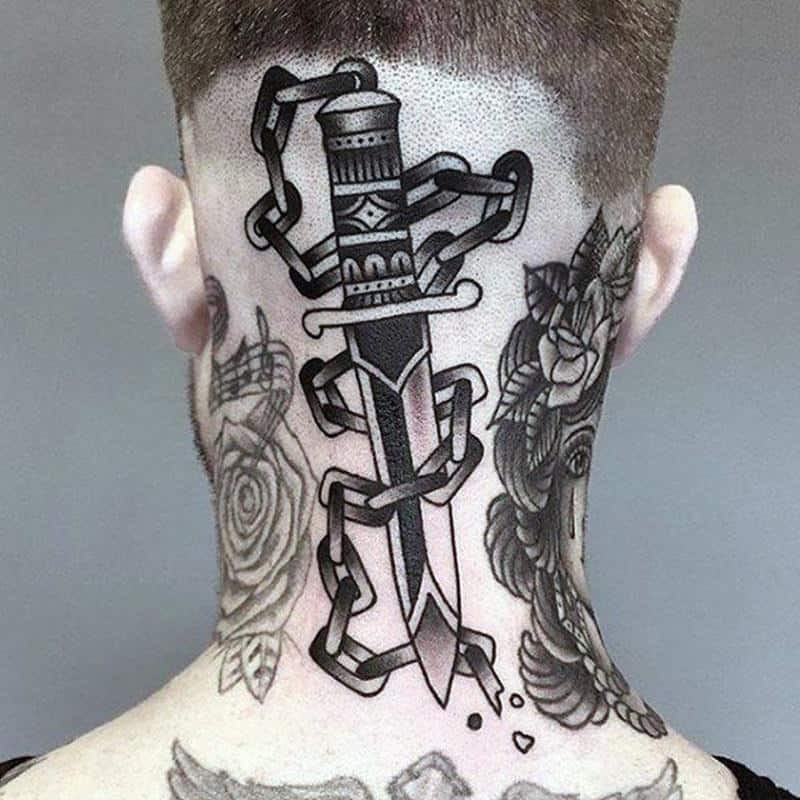 You will love this cool style because it makes it look like there are blades going into the body. 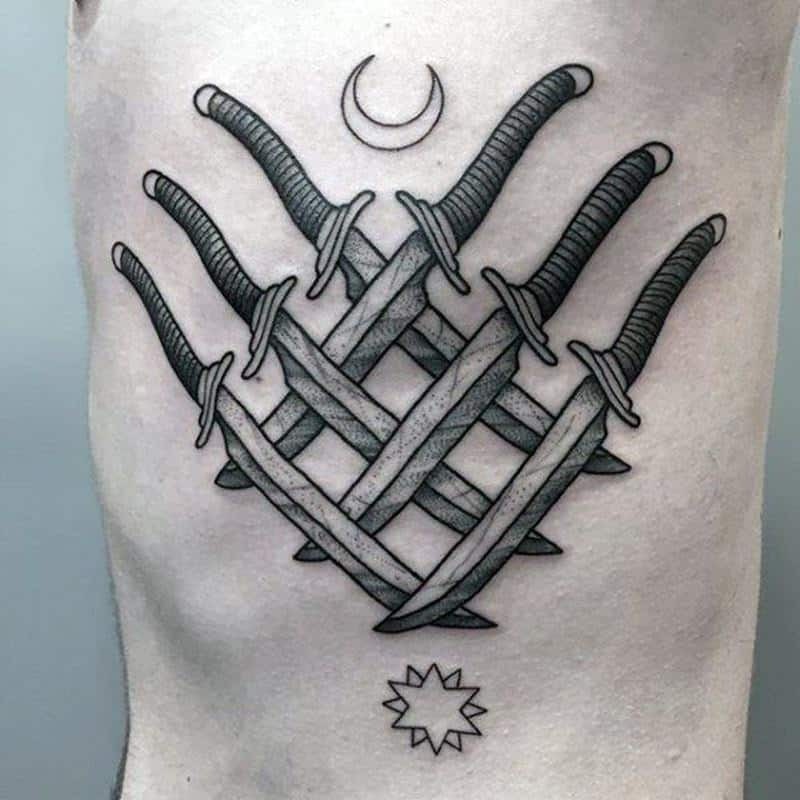 This cool design had multiple knives criss-crossing together. We love the way this style looks! 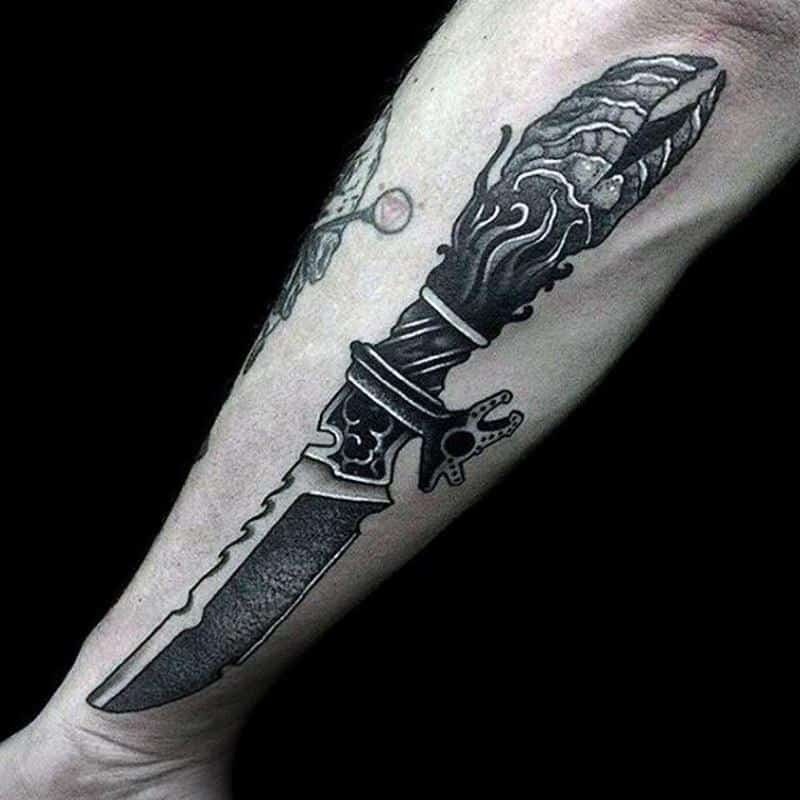 This is certainly a creative way of having a dagger on your hand. 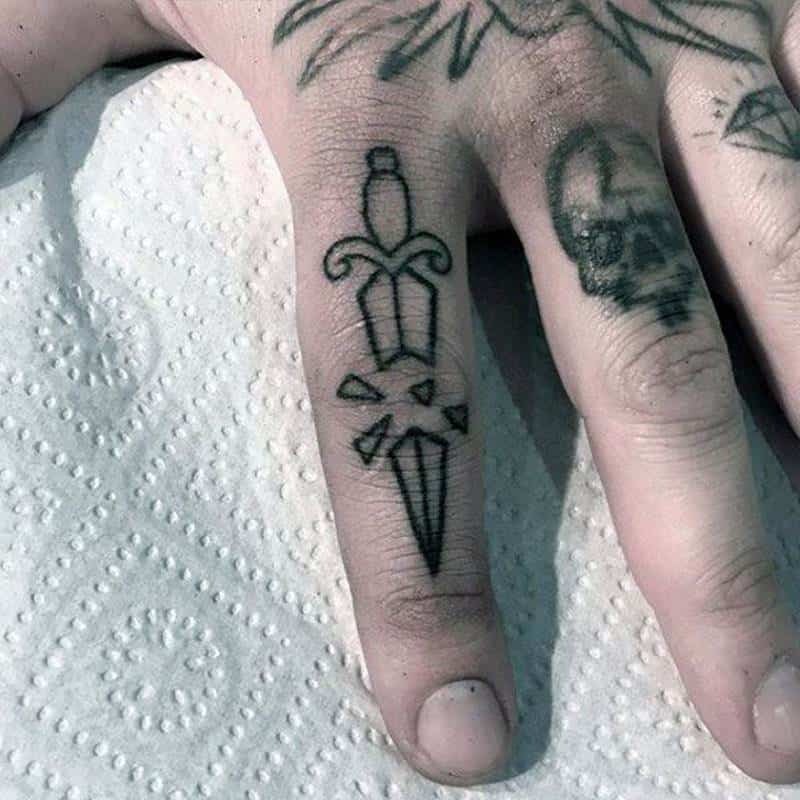 There is just a little bit on each finger but when all the fingers are brought together in a fist you see the dagger appear. 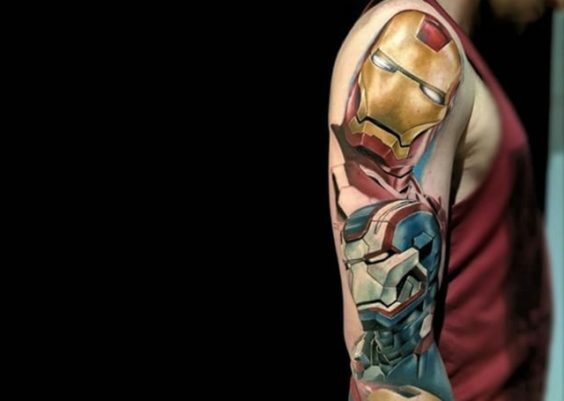 This tattoo design is very realistic and you can appreciate all the detail involved. The best part of the style though has to be the deep colors. The red especially just pops out at you and we can’t help but want to stare at it. It’s a gorgeous style that anyone would love. 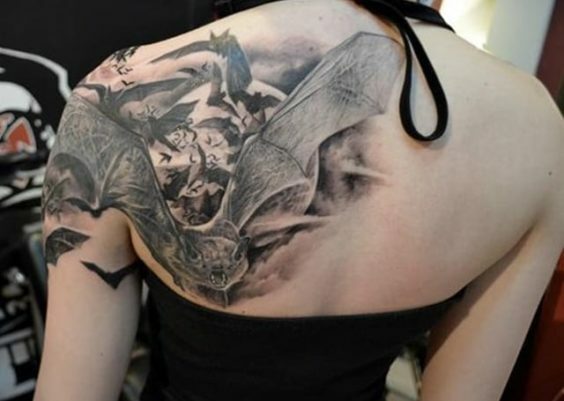 The tattoo certainly doesn;t look like much when you are looking at it in the beginning stages. But after we see a lot of detail and it looks almost like a portrait. 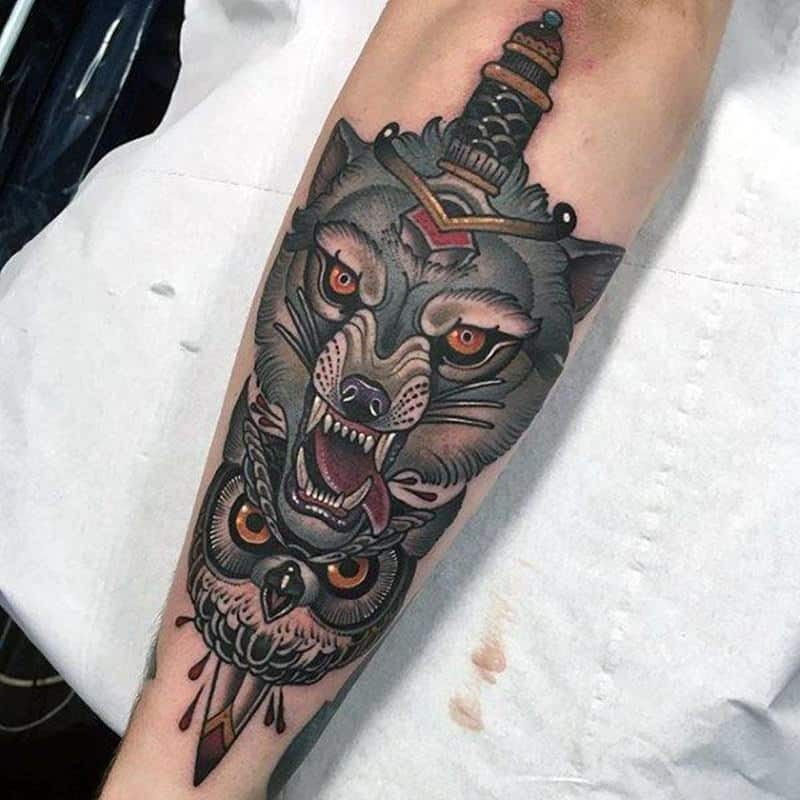 If you are looking for a unique tattoo design, then you can’t go wrong with this look. We have seen a lot of large designs throughout the article but not too many small ones. 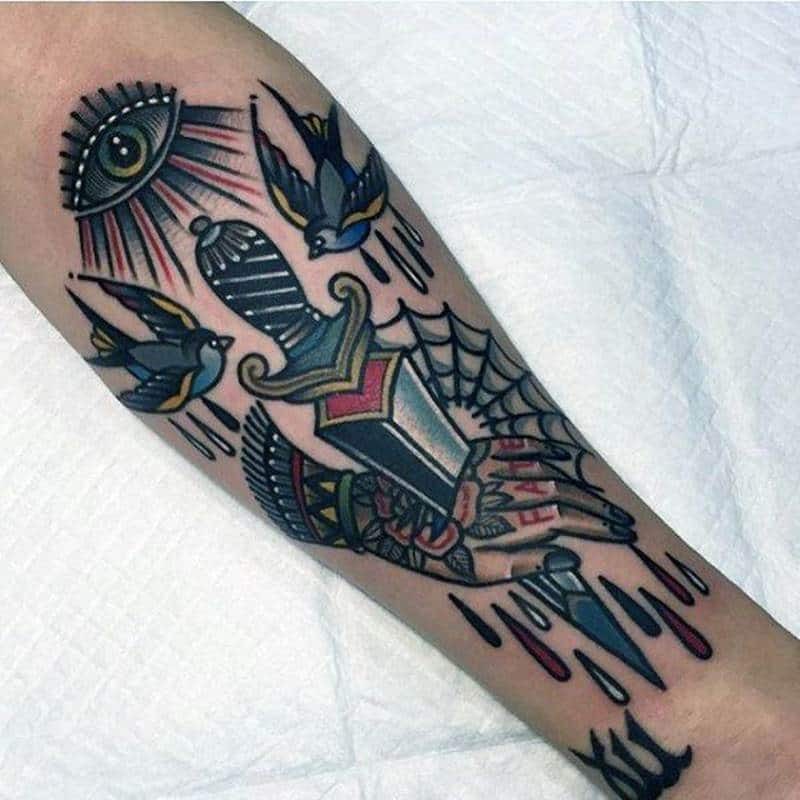 This one is a cool design that you could probably fit anywhere. 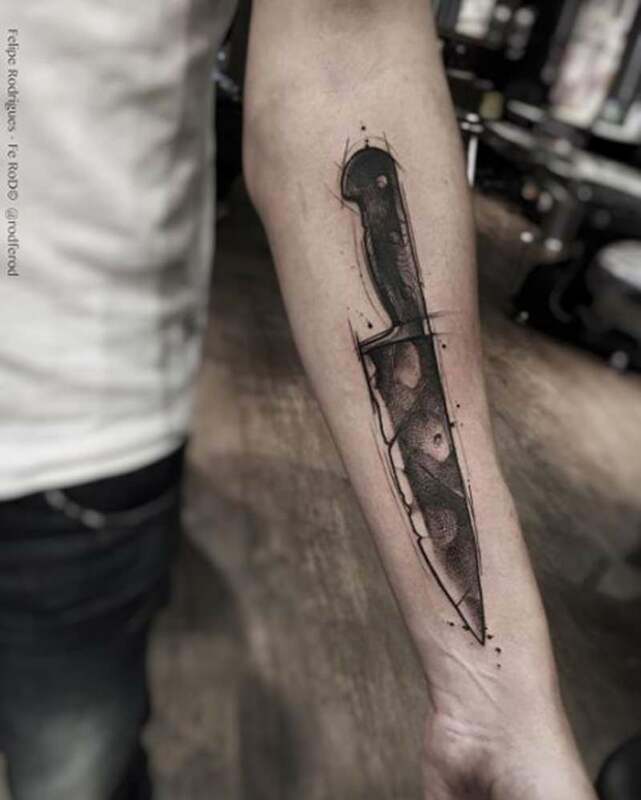 If you want something that is imbedded in teh skin, this would be a great design to try. 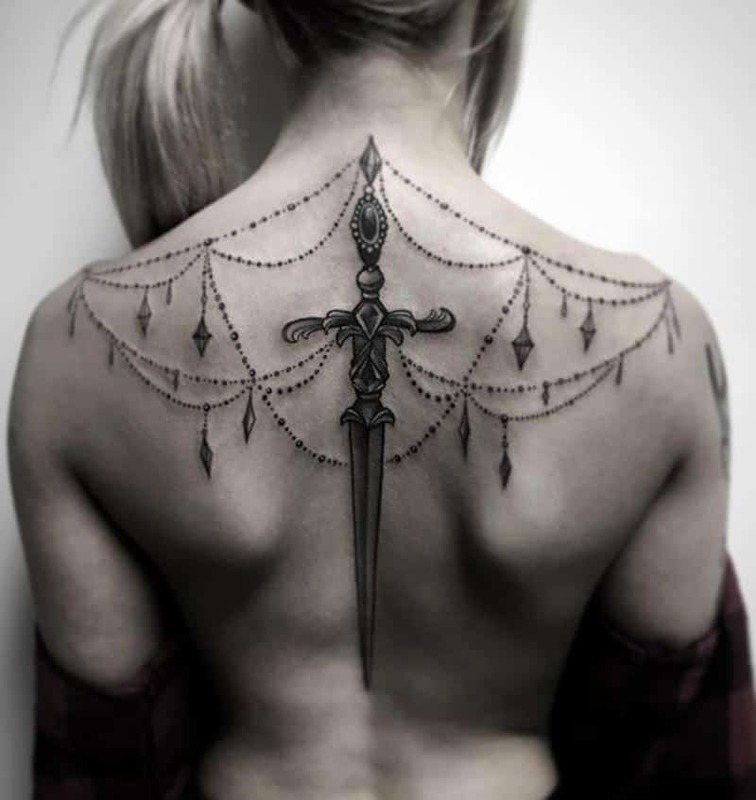 The chandelier designs are truly stunning and they are very popular tattoo ideas. 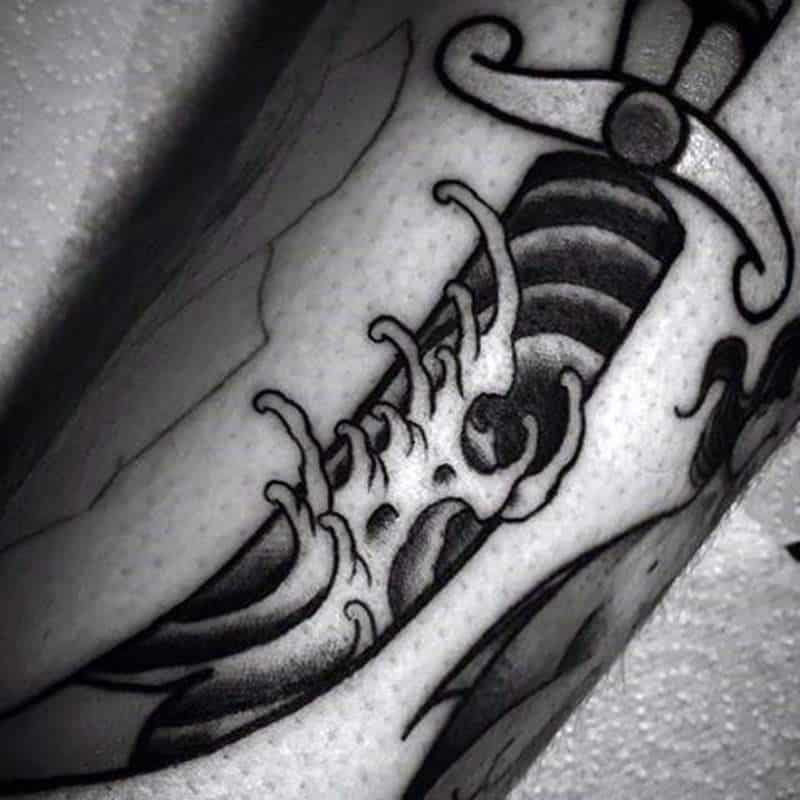 This one incorporates a dagger which makes the tattoo look more dangerous. 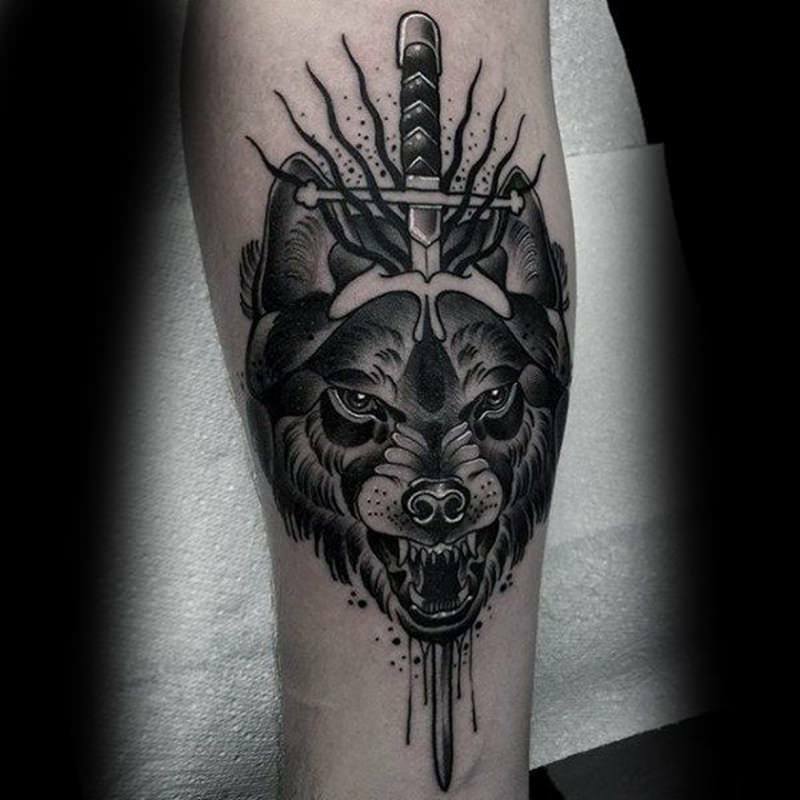 If you want a badass style that has some elegance to it, then this is the one for you. 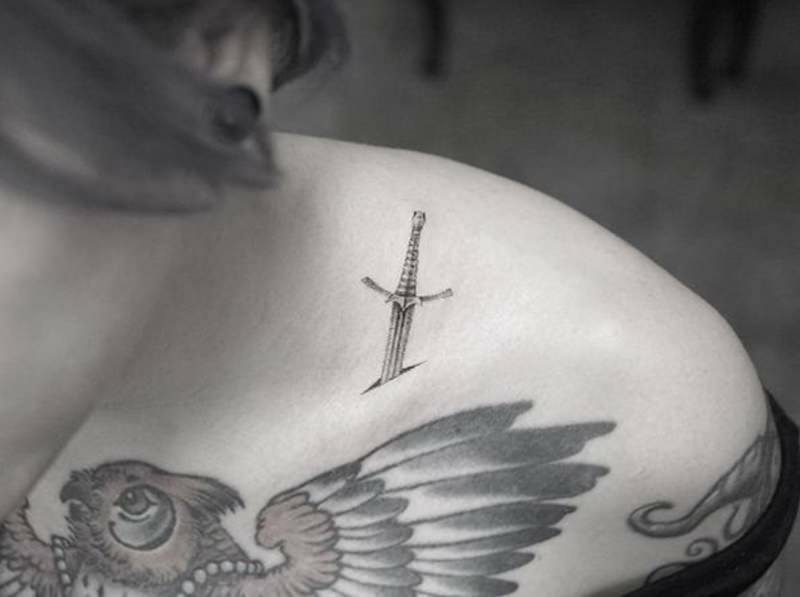 This is proof that even girls can have dagger tattoos. 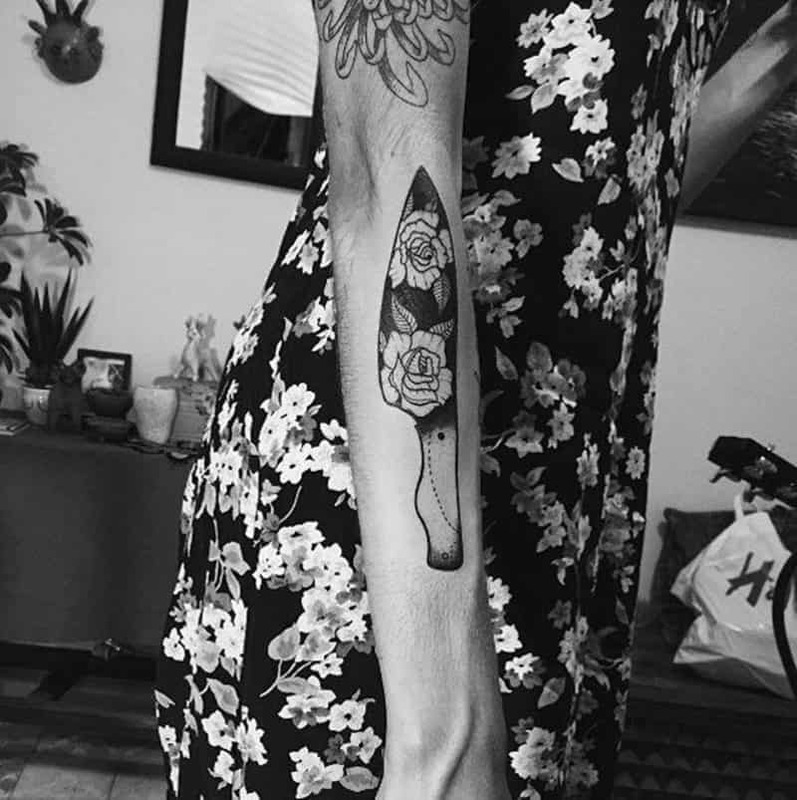 This tattoo design is that of a knife and has some Chinese floral designs on it. 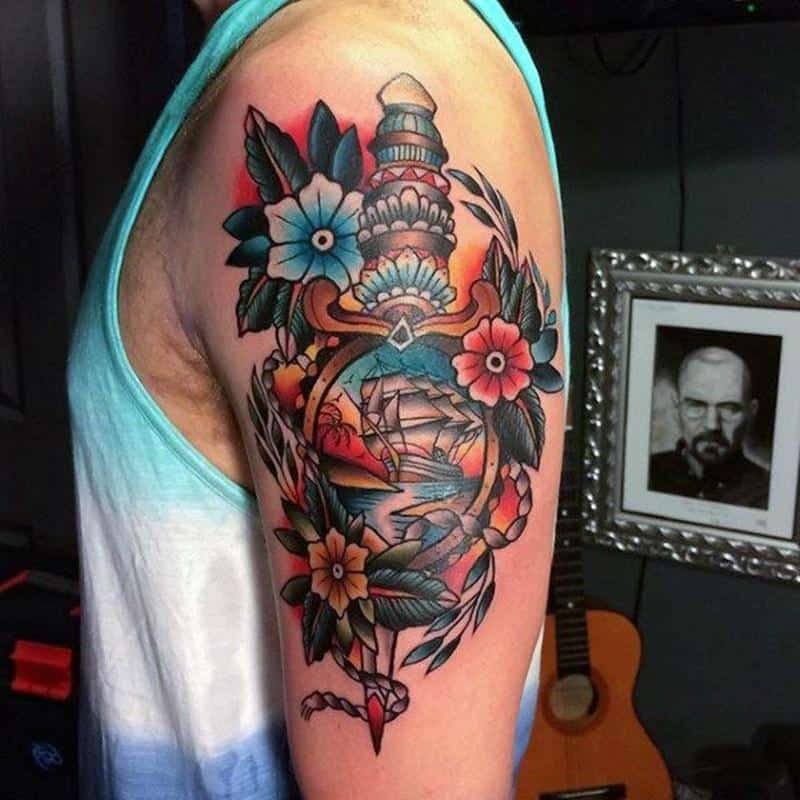 It’s a gorgeous tattoo that you are sure to love. 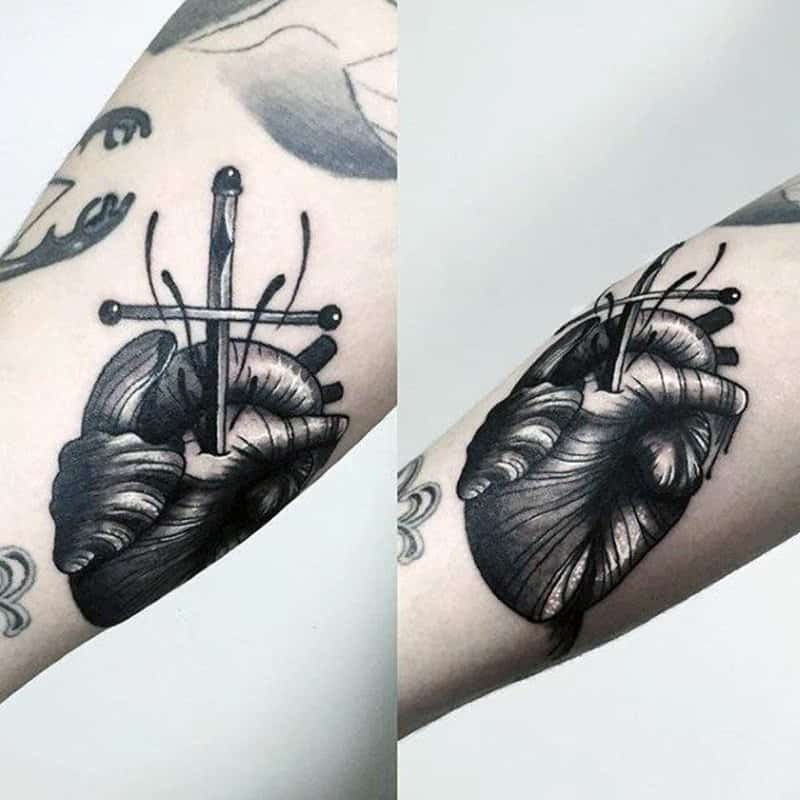 This is a very small tattoo design but it still packs a punch. 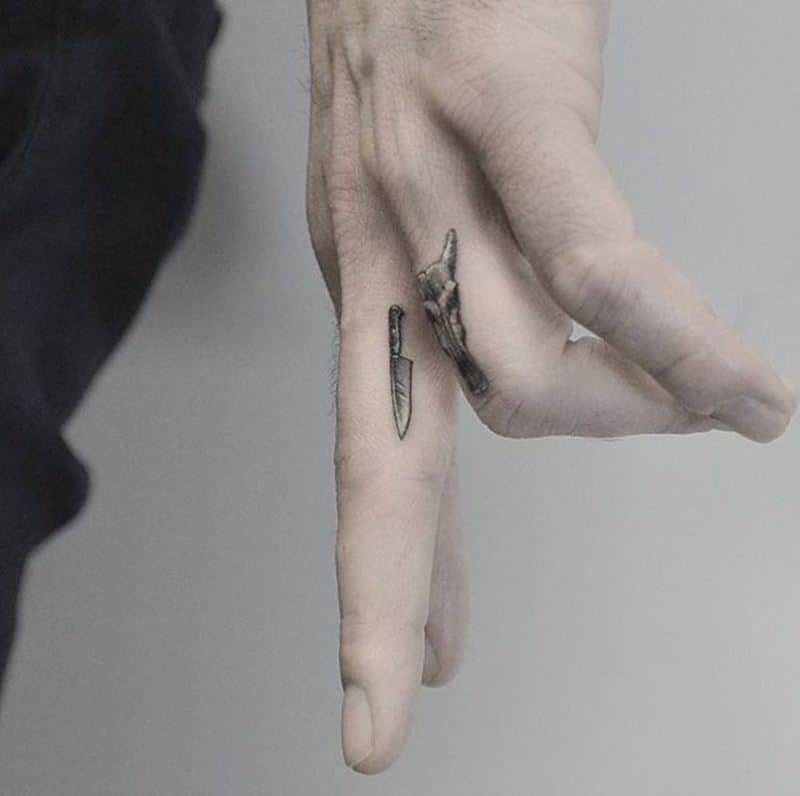 Between the knife and the bones, the tattoo sends a powerful message. 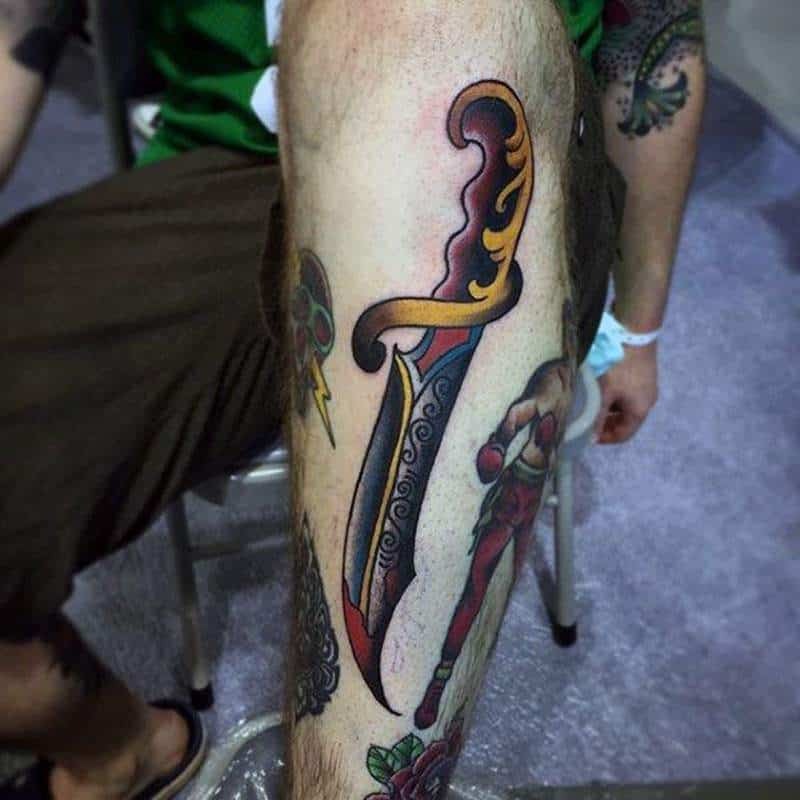 You don’t need to have a huge tattoo to show your love of knives and daggers. Try this cool style out today. This is a very simple image but it’s in different shades of grey and black. If you want a look that pops, then this is the one for you. 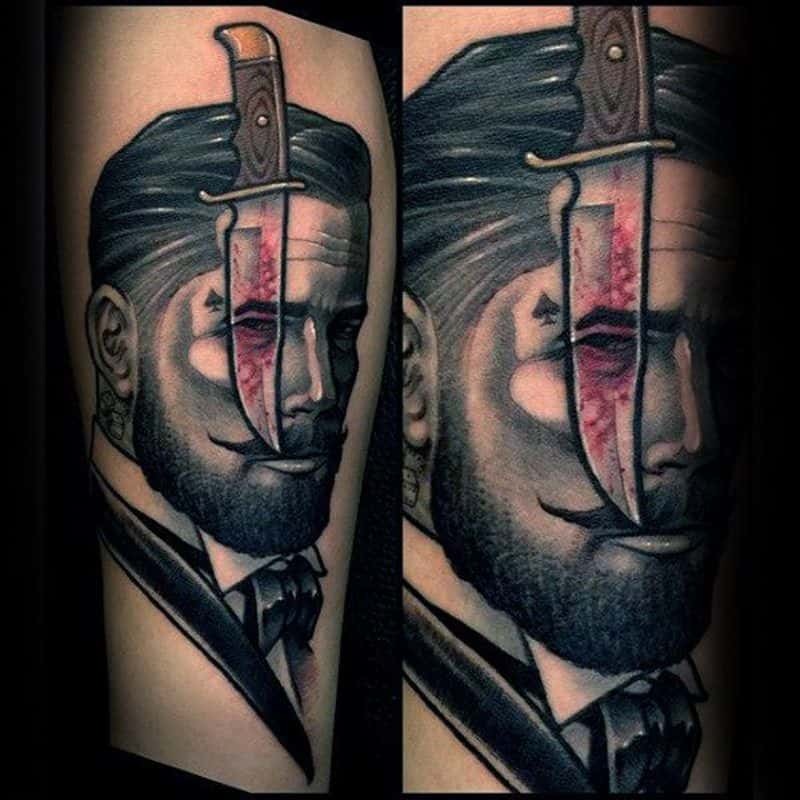 We love how there is a portrait reflecting in the knife as if someone is being seen through the glare of the knife. 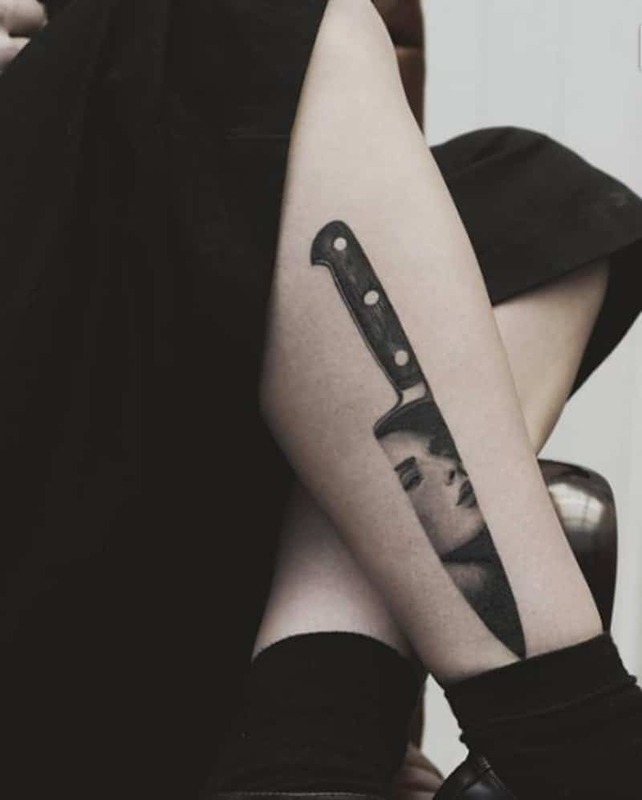 It’s very film noir and we absolutely love it. 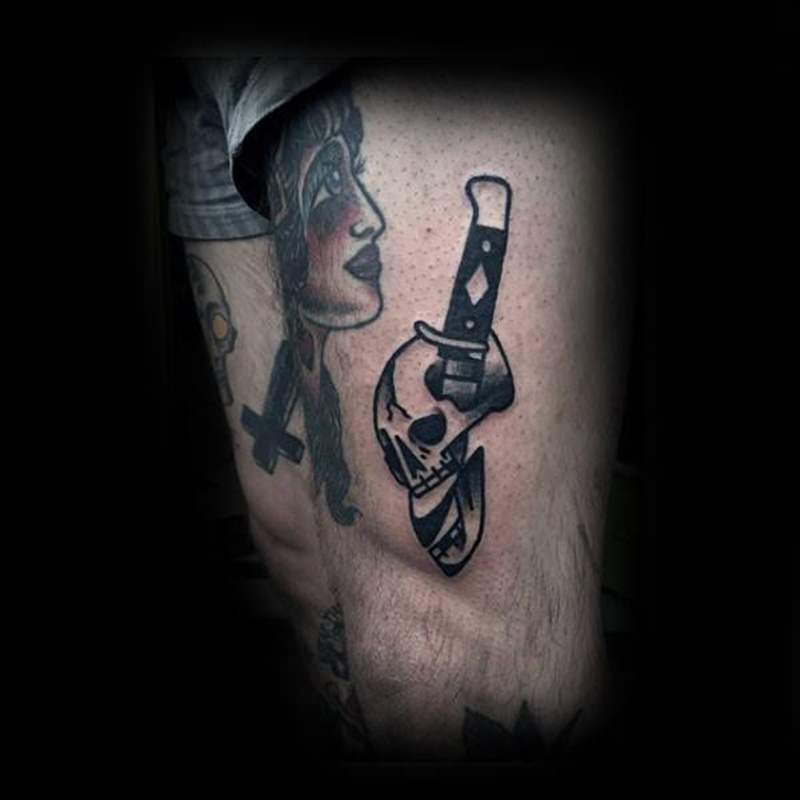 If you are looking for a black and white design, then this is the one for you.